Gene Tierney was one of the classic beauties of 20th Century Fox during the 1940's. Her most famous film is the 1944 film noir classic, "Laura." Who else but Tierney could have made a man fall in love with her, simply by gazing at him from a painting? 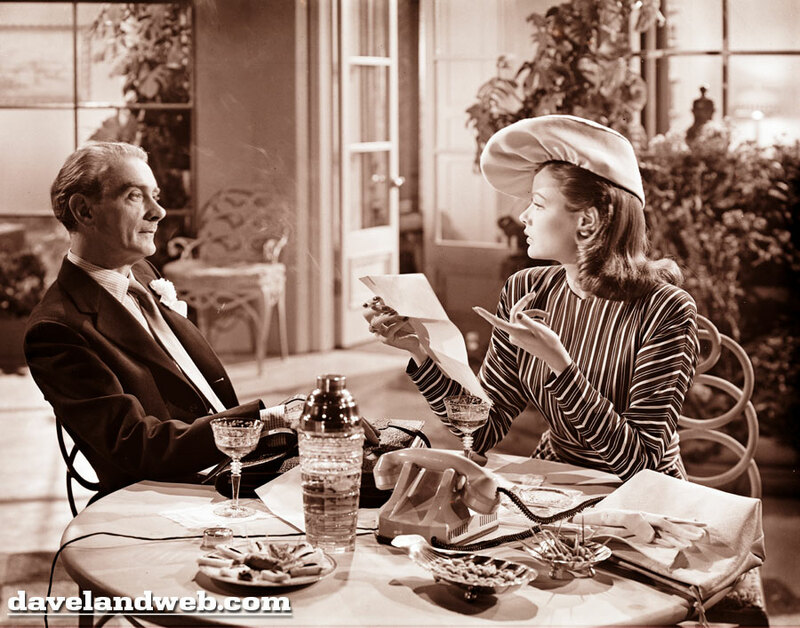 Here are two shots of Tierney from "Laura" with her co-star Clifton Webb, back when smoking was glamorous and lung cancer wasn't even a blip on people's radars. Supposedly Tierney began smoking to make her voice more husky. 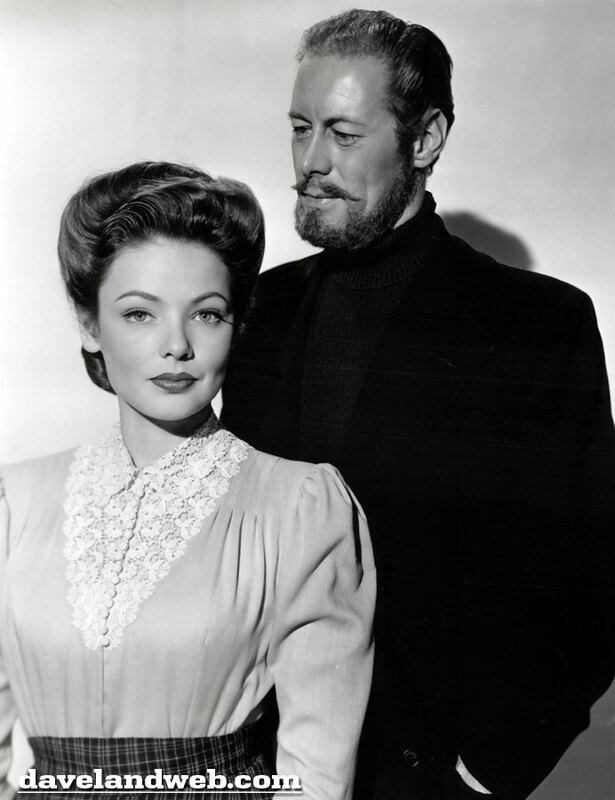 My favorite Tierney movie is "The Ghost And Mrs. Muir," which had a distinctly different tone from the situation comedy that followed it some twenty years later. Here is Gene with Rex Harrison, who was also perfectly cast as the gruff Captain Gregg. See more Golden Age of Hollywood photos on my Classic Movies & TV web page. 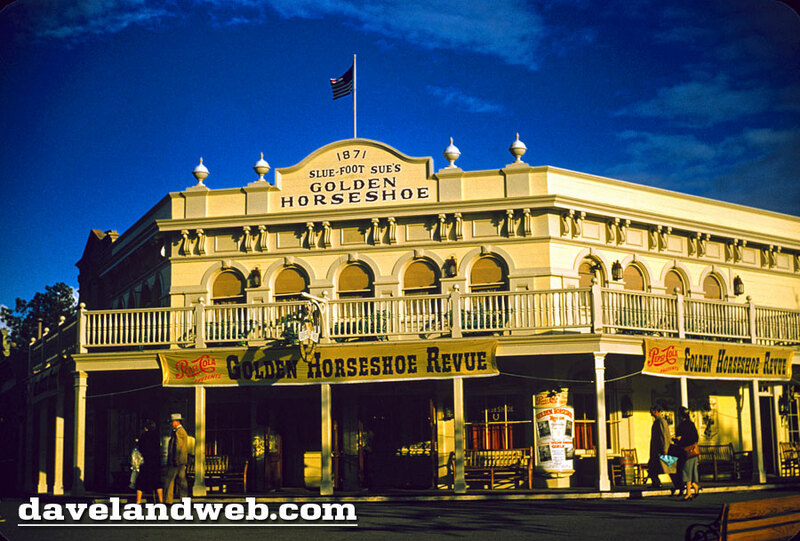 Even though the Golden Horseshoe is still at Disneyland, I would want to travel back in time and see a few shows featuring the original casts. How about this sign that used to hang out front? 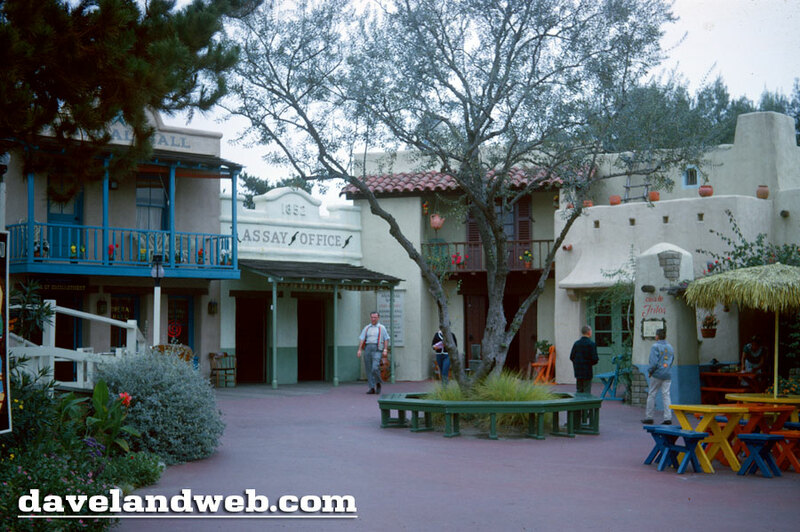 In most shots of the GH, you don't notice it, but thanks to a smart photographer from March 1956, I am able to feast my eyes on it in living color! 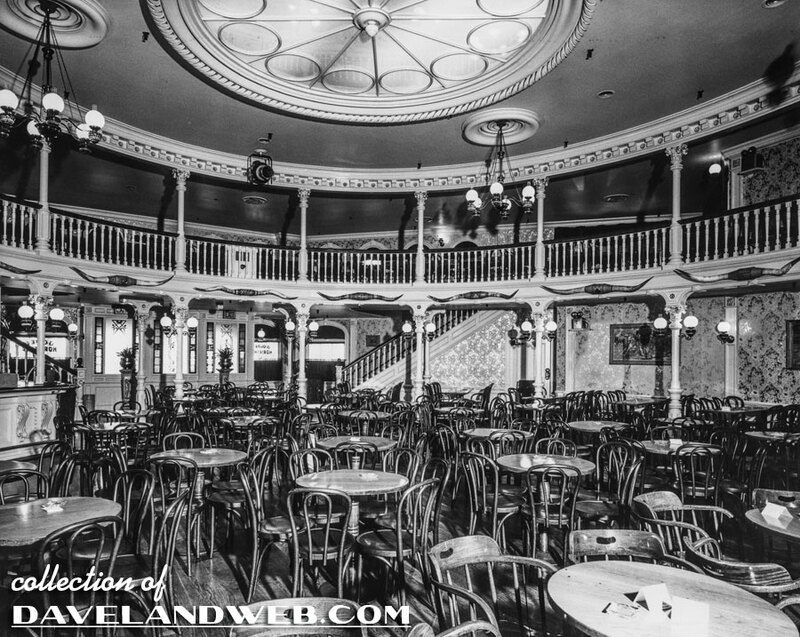 The saloon interior was designed by Harper Goff, who basically re-used his set design from the 1953 Doris Day movie "Calamity Jane." 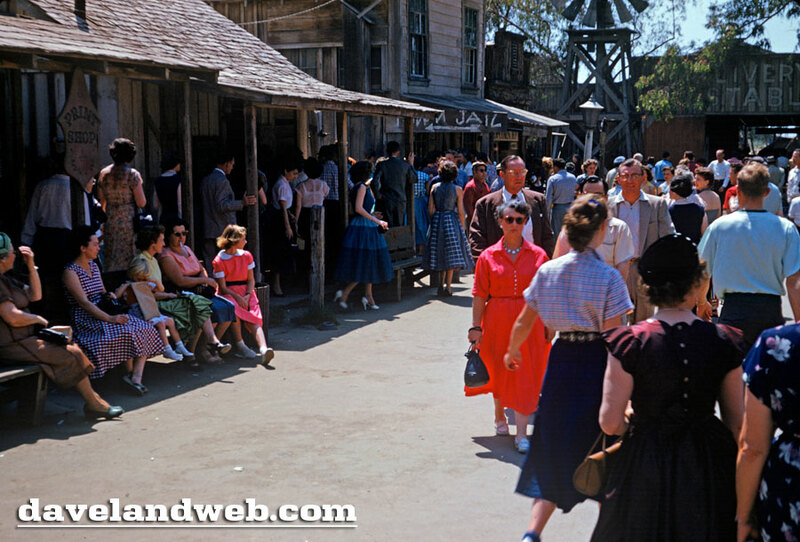 It was the perfect addition to Frontierland, providing the one bit of glamour allowed in an uncivilized territory! 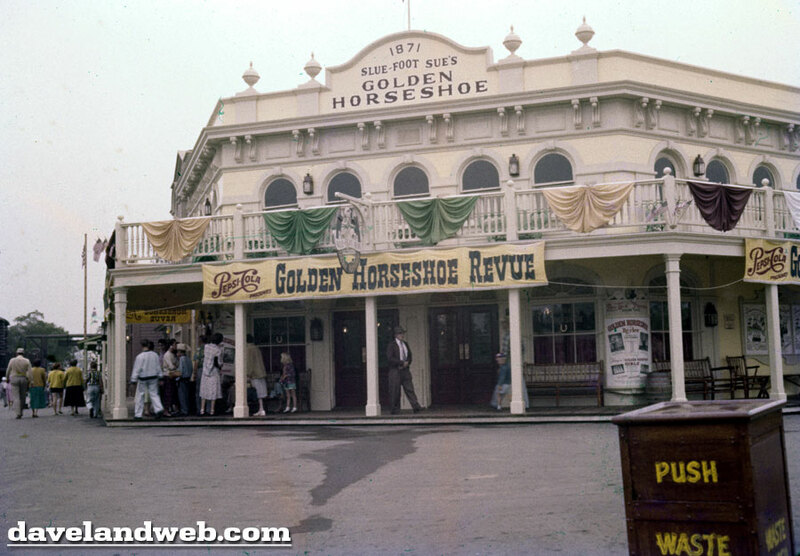 The first show at The GH was Slue Foot Sue’s Golden Horseshoe Revue, a 45 min. 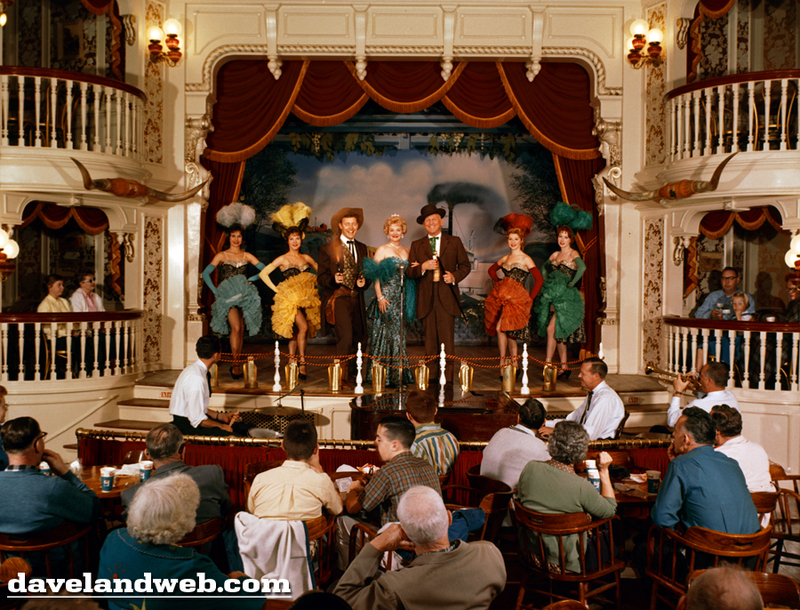 show which ran 50,000+ times and is listed in the Guinness Book of Records as the longest-running musical of all time. his signature balloon animals (aka Boagaloons). 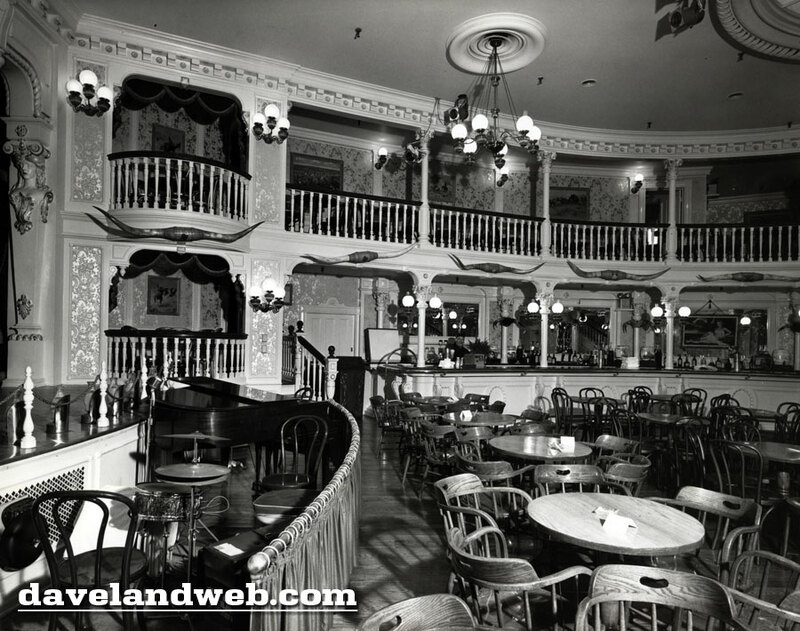 Boag began his stint at the Horseshoe with a 2-week contract signed with Walt Disney. 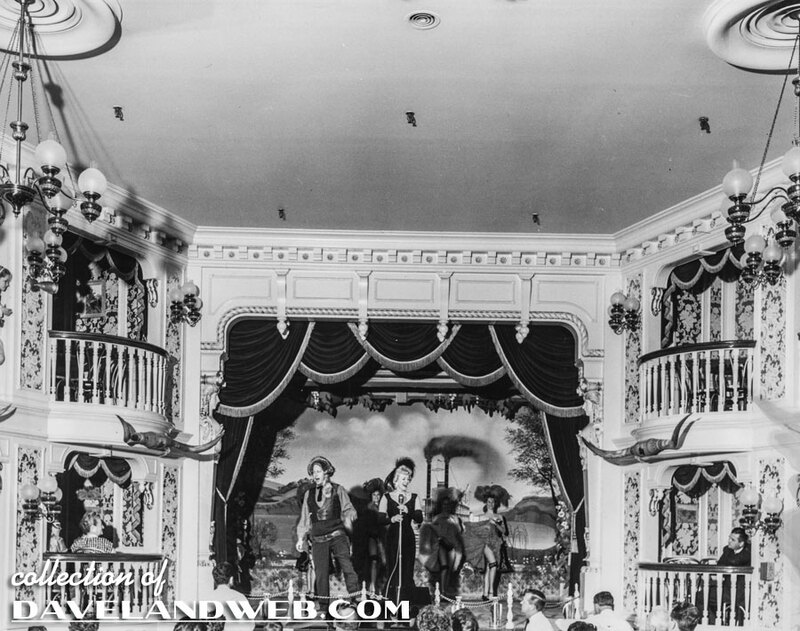 One of the features of the show was to have children in the audience sing & dance on stage; “Davy Crockett” was a favorite. 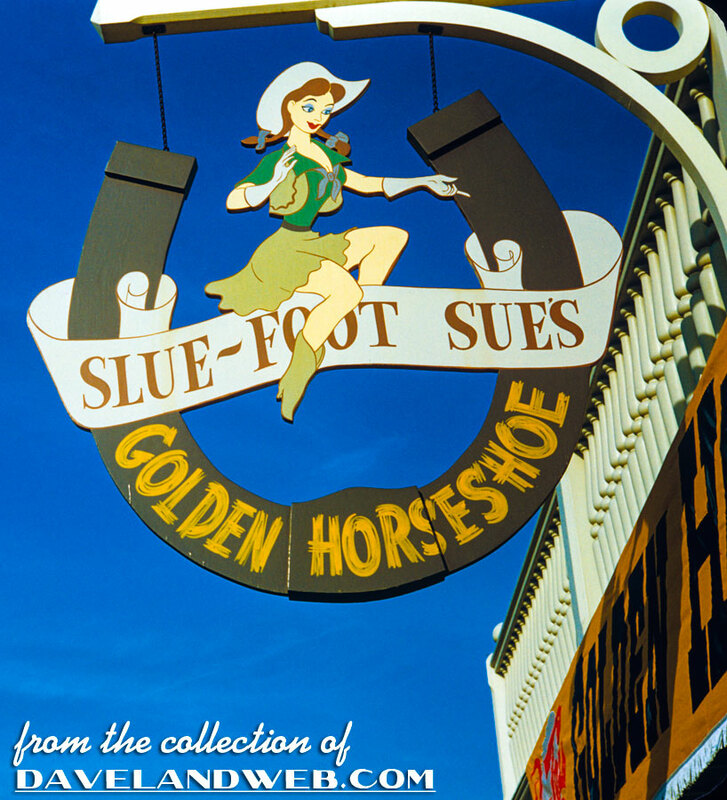 The role of Slue Foot Sue originated with Judy Marsh, and then was taken over by Betty Taylor in 1956 (who gave over 45,000 performances). The cast relaxes with (what else?) Pepsi! 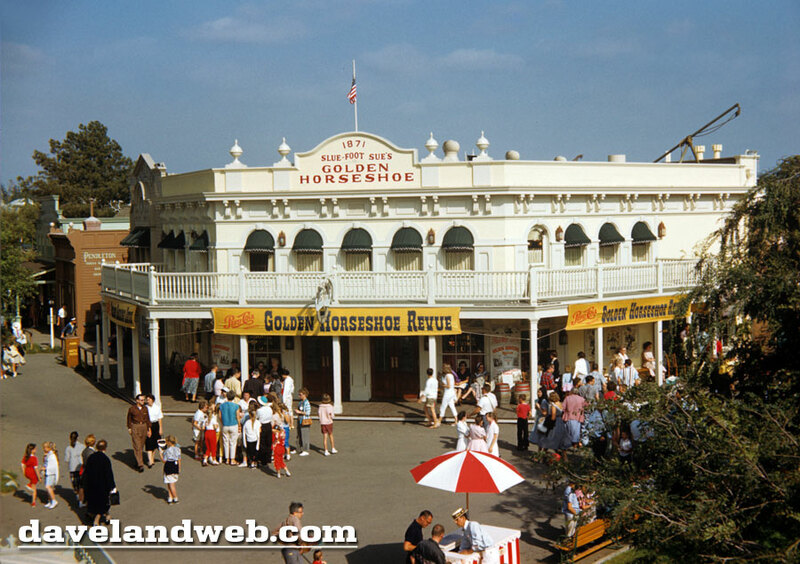 I have nothing but the fondest memories of working at the Horseshoe (1969 to 1974). Disneyland has been a family affair. My wife (high school sweetheart during the Horseshoe years) was Snow White in those days. I used to take off my bow-tie and garters to sneak off to Main Street and watch Cathy in the parade. 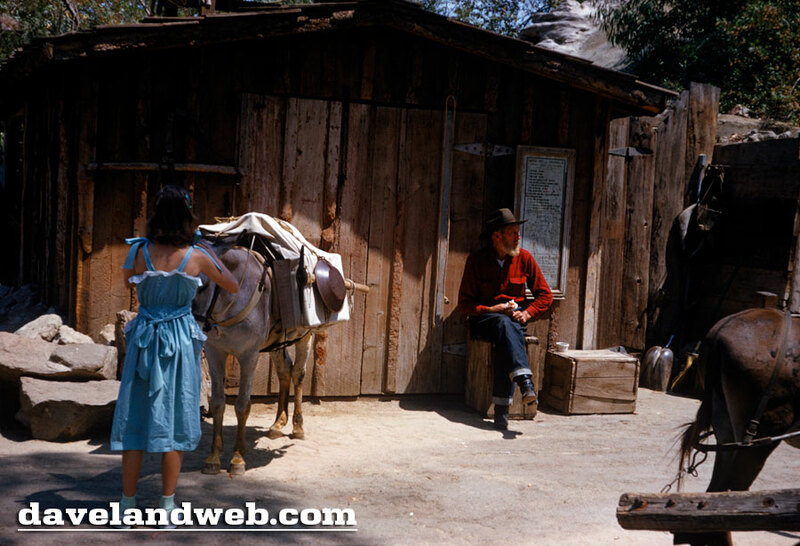 Years later, our older daughter Kariann worked in Frontierland operations for five years. More recently, our youngest Katie danced in the Parade of Dreams and the Christmas Parade. Now she is a Laker Girl. Back to the ‘Shoe. 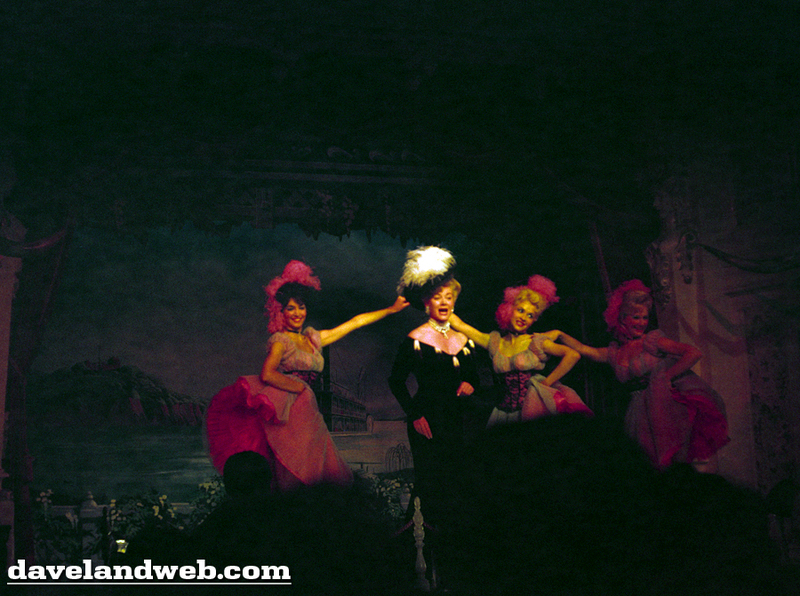 Wally, Betty and Fulton were still doing the Revue, with Bert as Wally’s sub. Several of the guys I worked with had a crush on one of the dancers (Terry Robinson) – she was a very nice gal. I never got tired of watching that show. 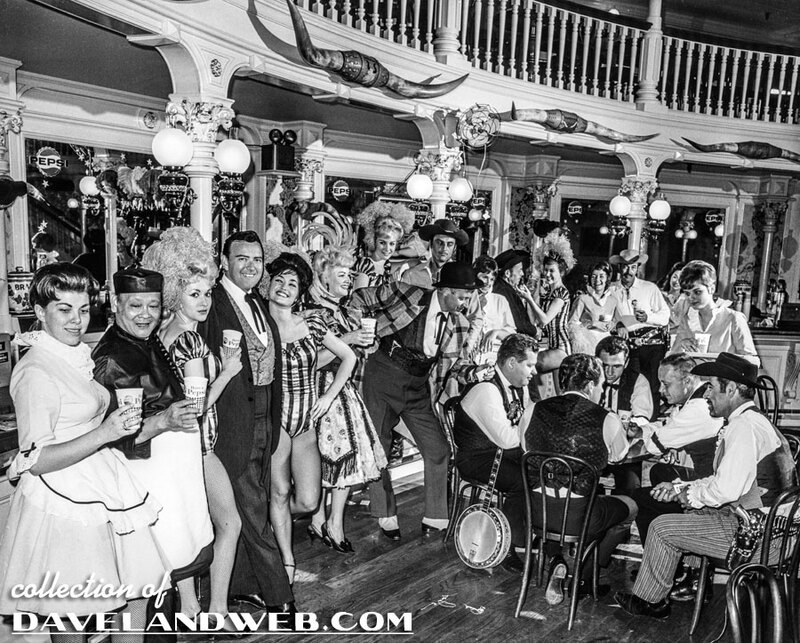 At night the entertainment was highlighted by Sonny Hellmer and Banu Gibson doing a Roaring 20’s show. Sonny would chug an entire pitcher of Pepsi every show. Special engagements were common back then. 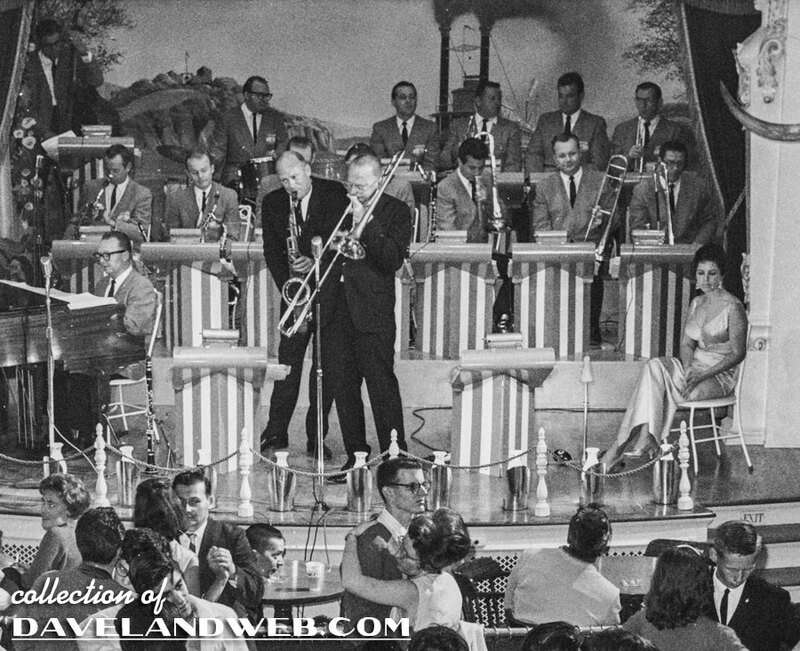 Such stars as Conway Twitty, Xavier Cugat & Charro, Buddy Rich, etc. The Kids of the Kingdom weren’t bad either. Truly, working at the Horseshoe was always fun. I never had a hard time doing my shift. As to the inner workings of the operation, the work was hard because we had to fill the house and serve every guest before the show began. The menu included tuna, beef & cheese and ham & cheese sandwiches (the h & c had great marbled rye bread). 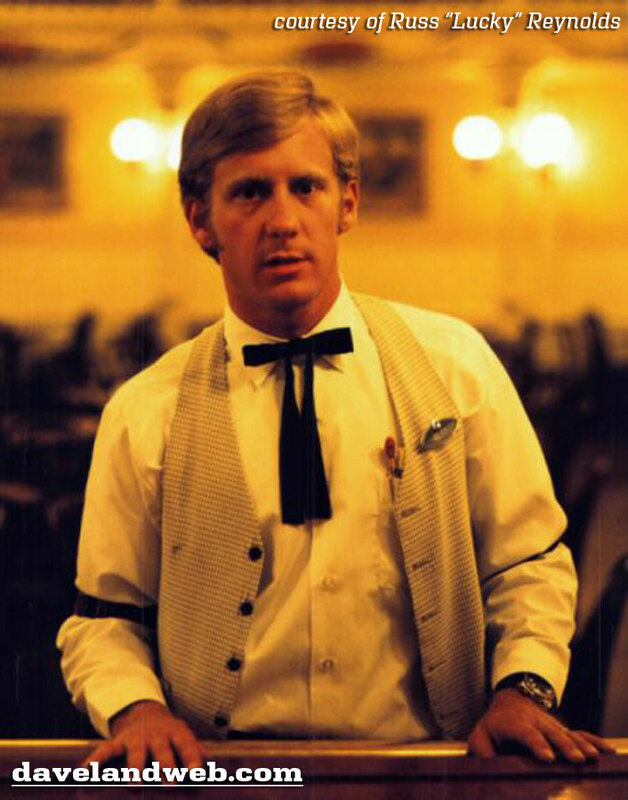 The waitresses had the toughest duty by far. There were a lot of breaks, however. While the shoe was on we all retired to the little foreman’s office upstairs. We played a lot of pinochle and poker and quickly bonded into a very close group by virtue of the close quarters and the many breaks during a shift. 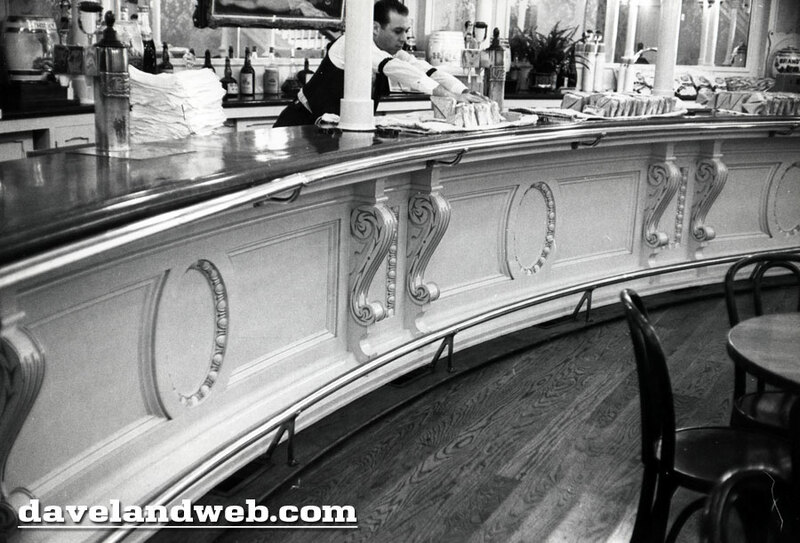 Yes, there were several weddings between bartenders and waitresses over the years. Now, 40 odd years later, we go back often as season tickets holders. 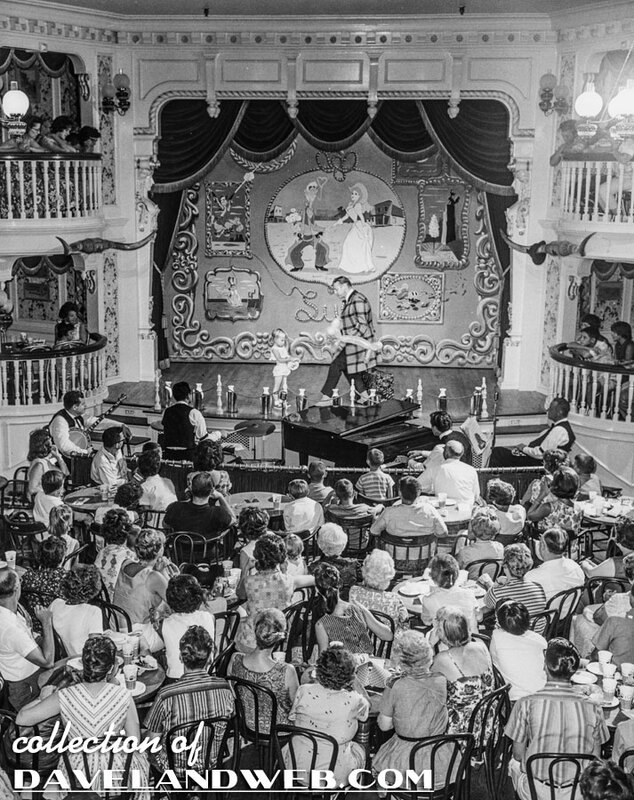 Although we Enjoy Billy Hill & the Hillbillys, they are a far cry from the Revue. Those were the days! Pepsi was a huge sponsor of The Horsehoe for years, underwriting the expense of the excellent entertainment, etc. at this unique venue. Several years after I left in the 70’s they pulled-out and left the budget in a hole, which was too bad. 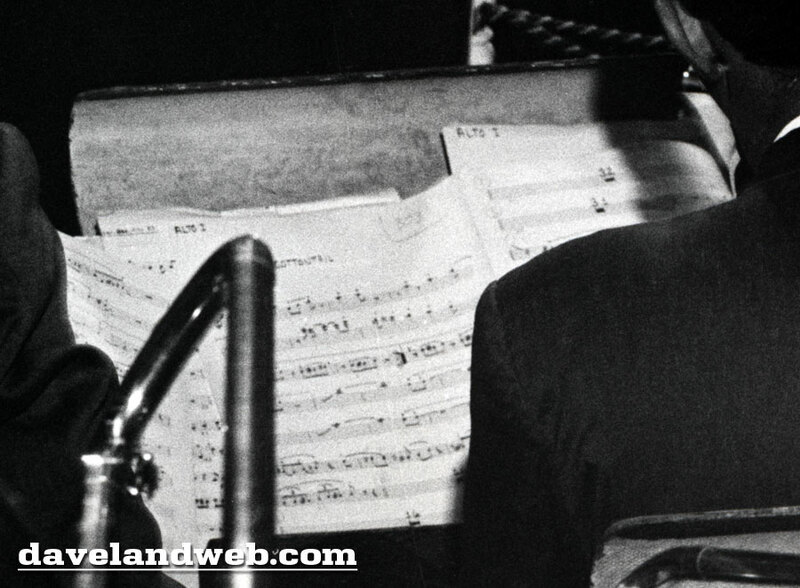 Walt was right with his belief that the bottom line took care of itself if the vision remained pure. Thanks for the opportunity for nostalgic memories. Follow my Daveland updates on Twitter. 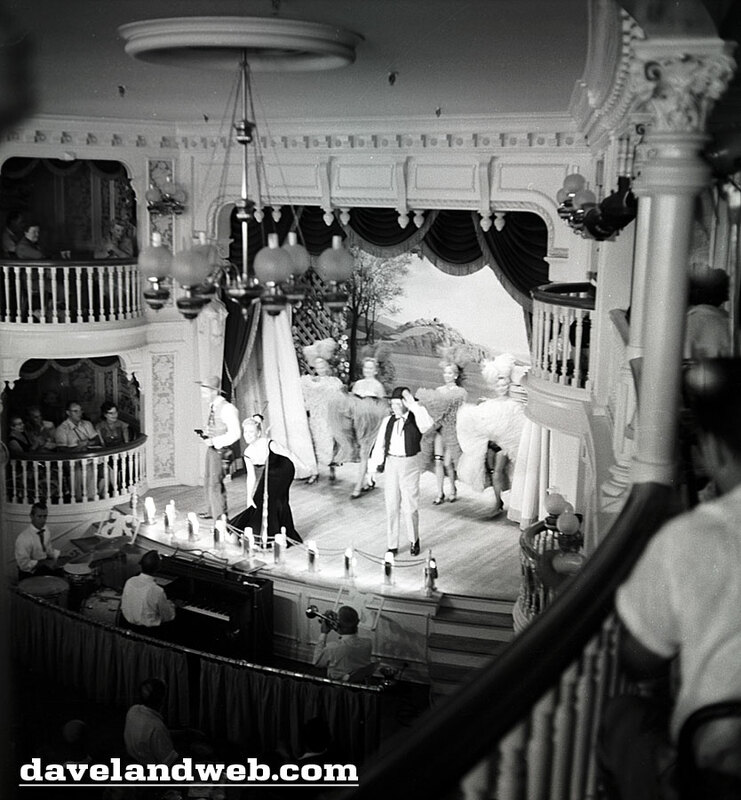 See more vintage & current Disneyland Golden Horseshoe Revue photos on my Golden Horseshoe web page. 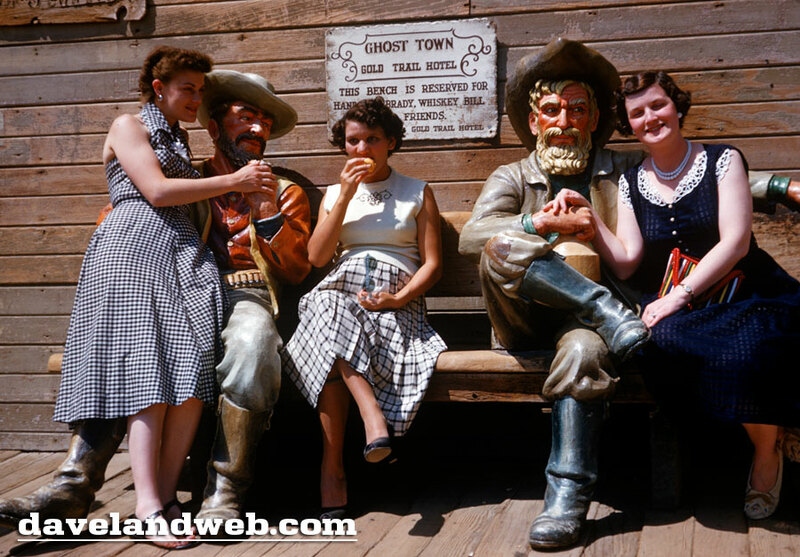 The family that visited Hollywood also stopped by Knott's Berry Farm. 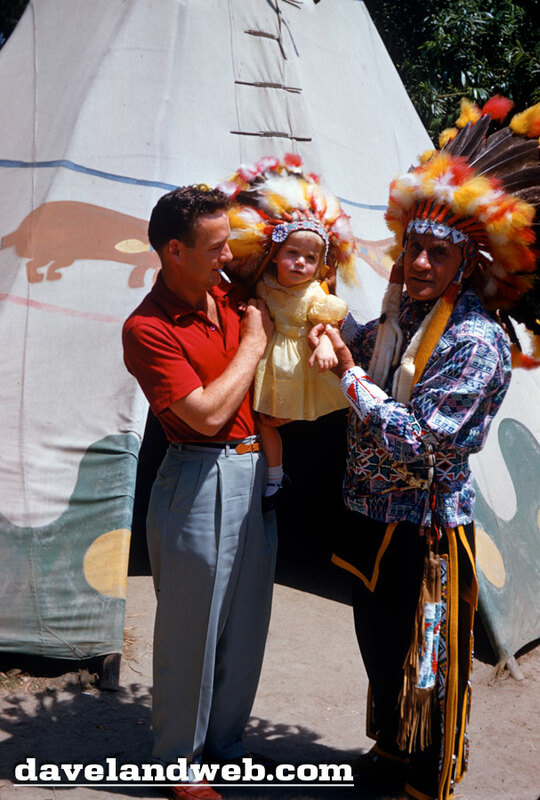 Again, I believe these are either 1954 or 1955 images. 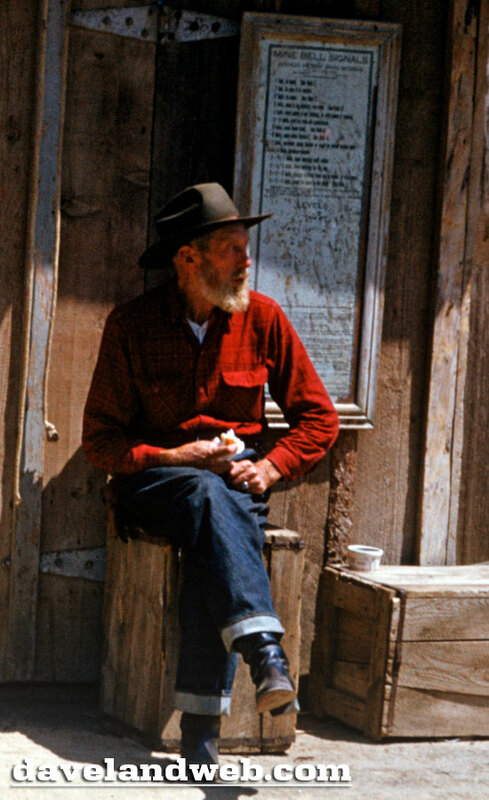 Zooming in on the old gent makes for a very cool shot all by itself. 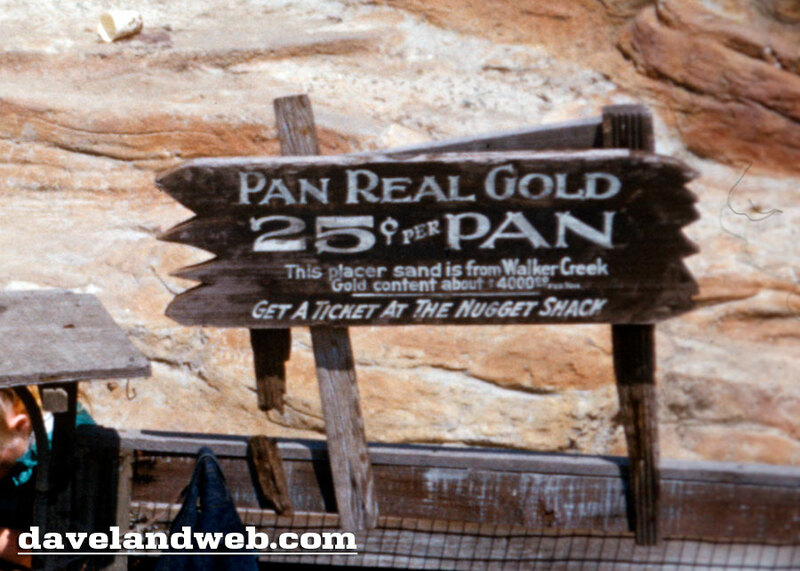 If you can't win the lottery, how about shelling out a quarter to pan for some gold? I am in signage heaven! Hand done, too! A quarter also gets you some assistance from the Miner on location. I believe the gal in the middle is sucking on a lemon, getting ready to do tequila shots with her friends. 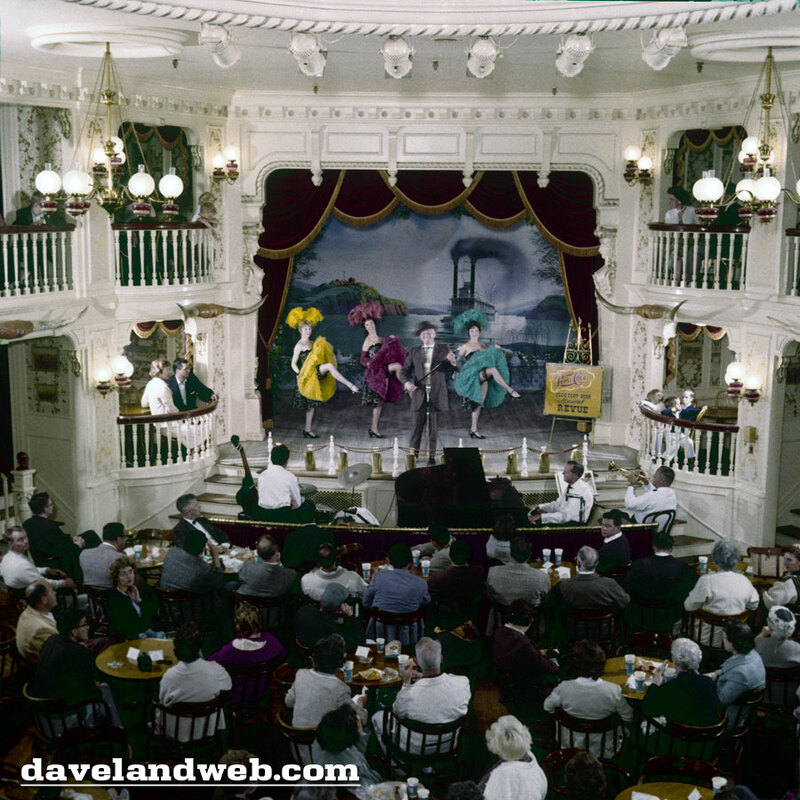 "Live" music at the Wagon Camp! Follow my Daveland updates on Twitter. 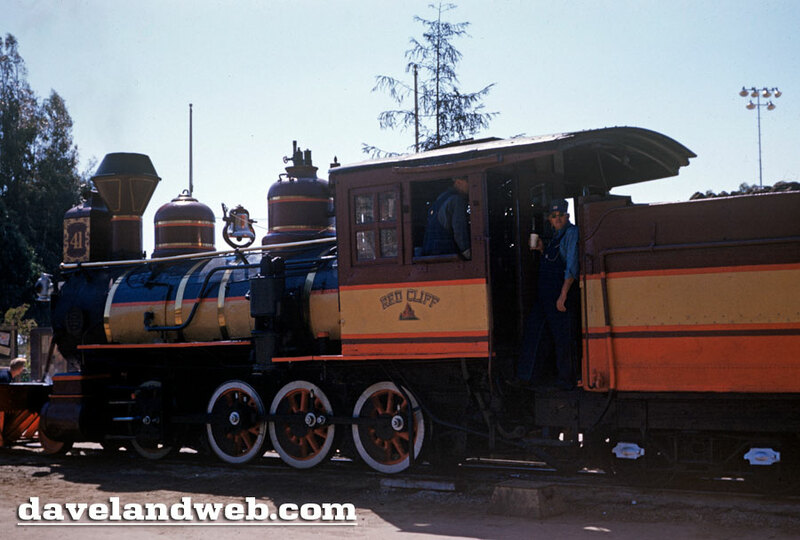 See more vintage & current Knott's Berry Farm photos on my Knott's Berry Farm web page. 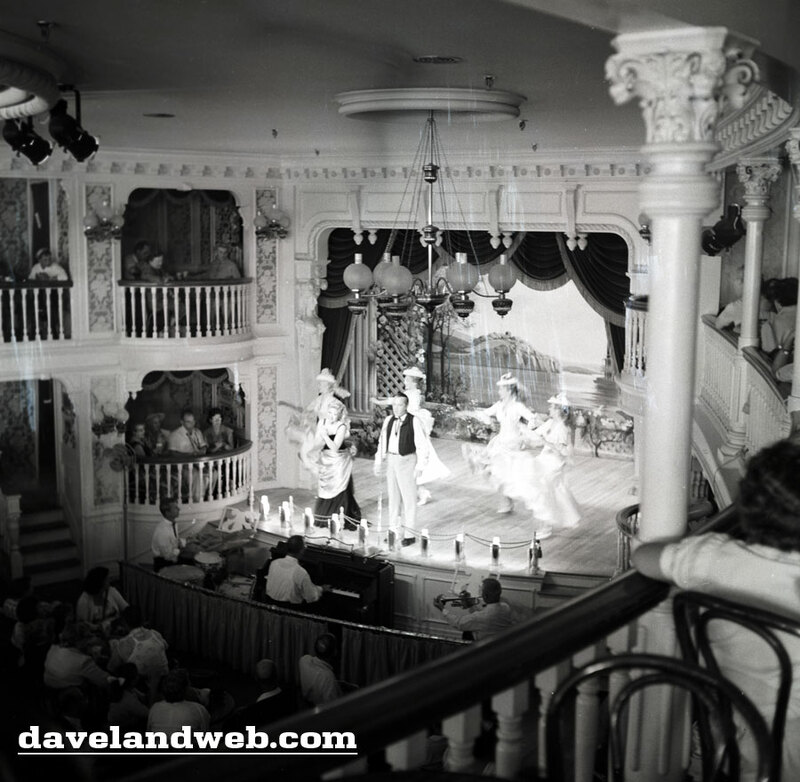 Follow my Daveland updates on Twitter and view my most recent photos on Flickr and Instagram. 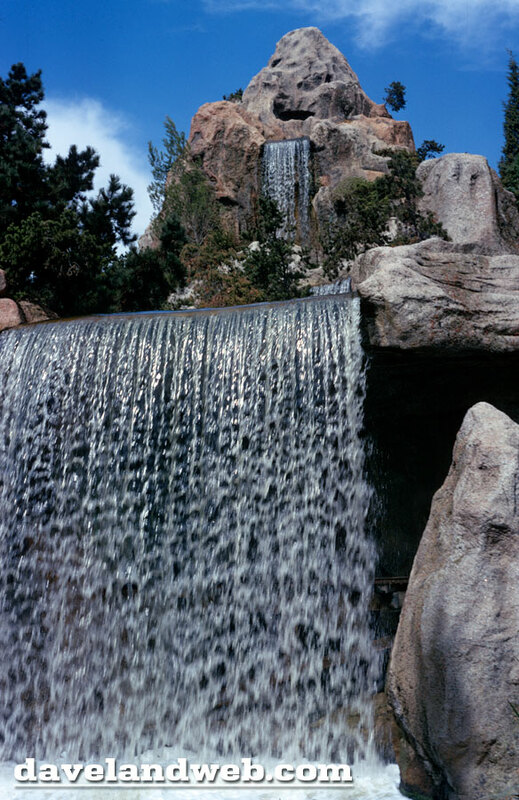 The long-gone Nature's Wonderland attraction at Disneyland has more than its share of fans who still reminisce fondly about the scenery and thrills that guests could experience while riding it. 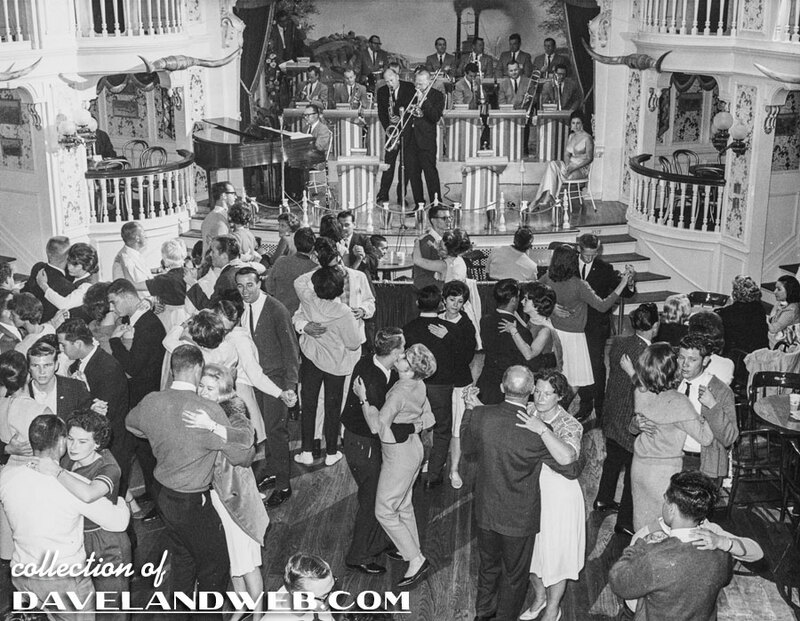 Daveland reader Bob Weaver eloquently put his memories into words for me, and with today's post, I will attempt to marry my images with his text so that you can immerse yourself into this gone (but not forgotten) journey of long ago. 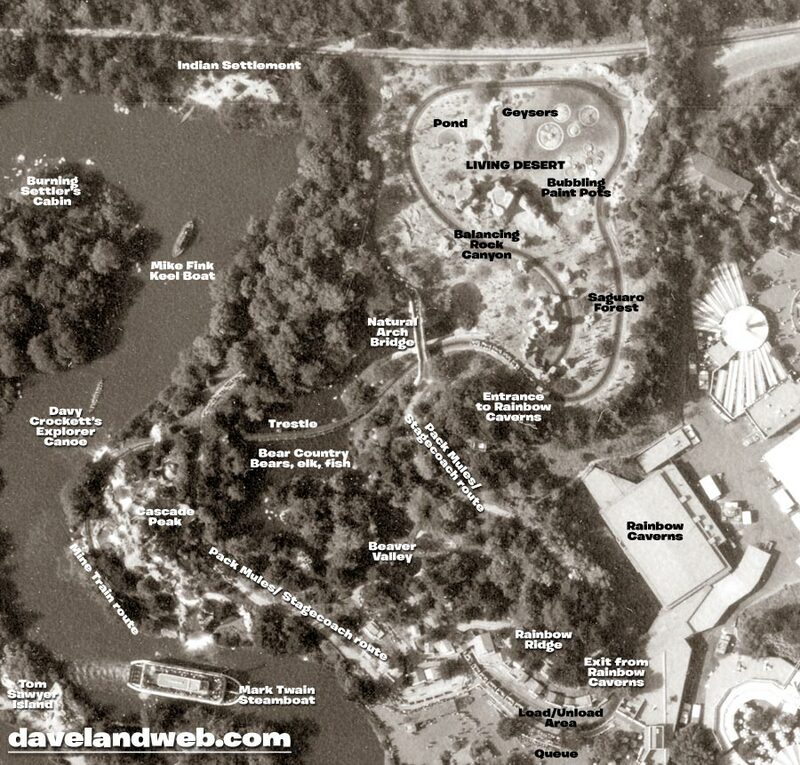 The first image is an aerial view from approximately 1965, showing the different scenes that guests would encounter along the way. 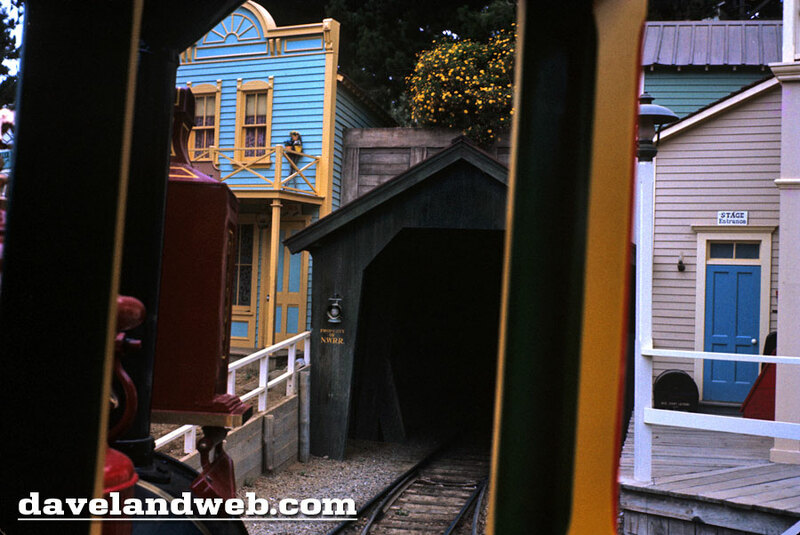 The Mine Train ride began with the train entering a tunnel between the buildings of Rainbow Ridge. 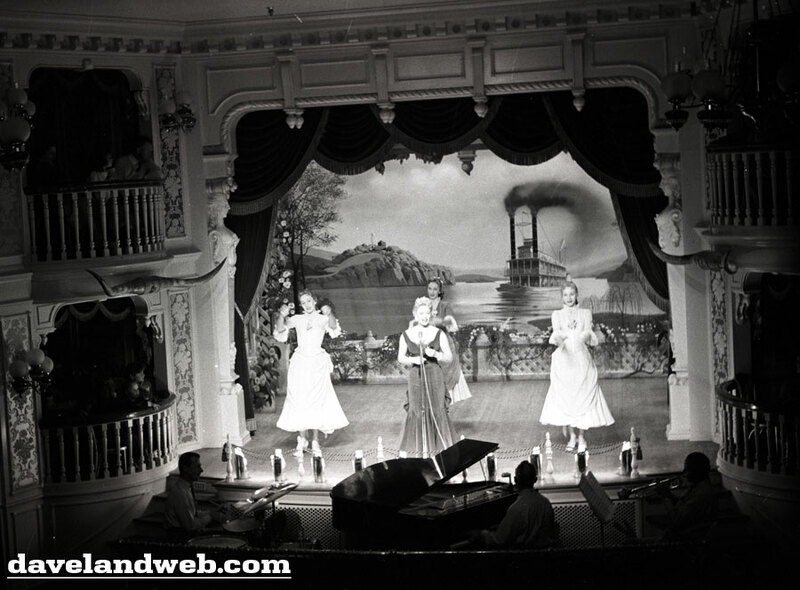 There was the obligatory warning by the narrator to remain seated and keep your hands and arms inside at all times ("the animals get mighty hungry") and for some reason on this attraction there was also a no-smoking warning. 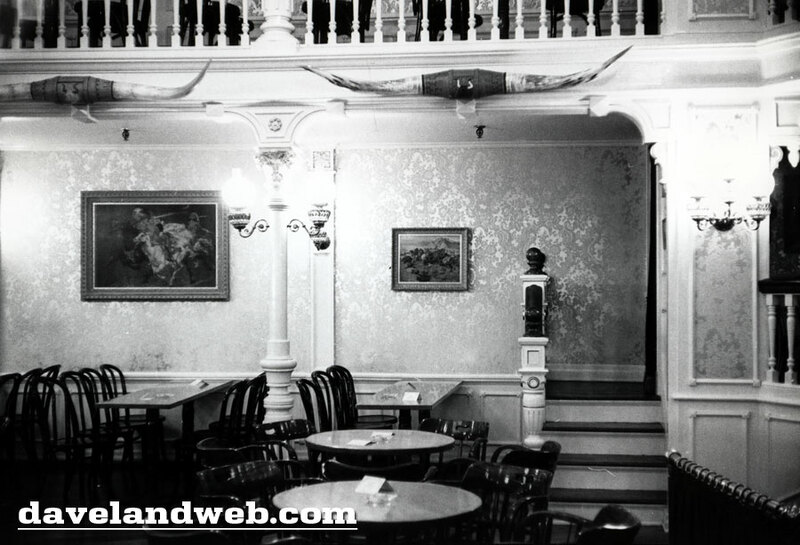 At the time the narration was recorded, smoking was a lot more popular among Americans than it is now. I guess there was a possibility of a discarded cigarette starting a fire among the very real vegetation througout the journey. The narrator said we would be seeing a lot of wildlife, so we should "keep a real sharp hunter's eye." That statement confused me as a kid: was that some sort of tool we were supposed to have and why wasn't I given one? On exiting the tunnel the train entered Beaver Valley, which had a little pond and there were beavers building a dam. 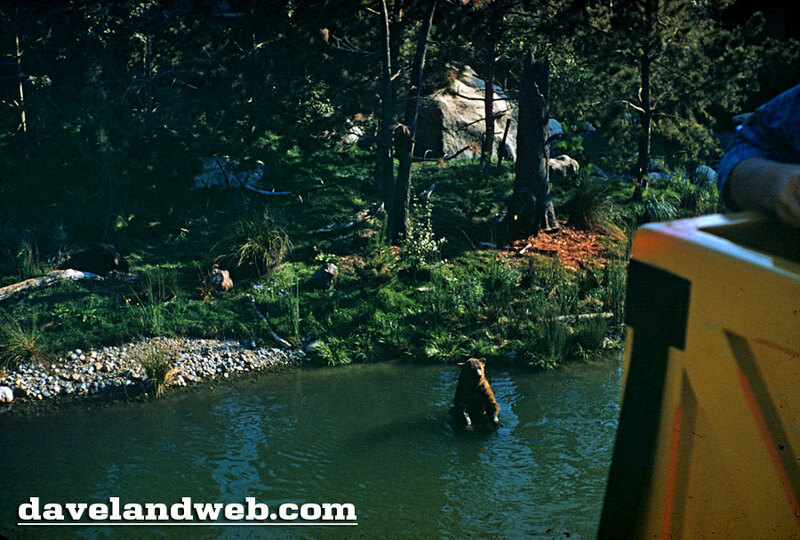 I should mention that none of the animals seen on the attraction were real; they were all "audio-animatronic" or mostly just "animatronic" because they made no sounds. There were never any real animals unless they were wild and happened to take up residence there, such as the birds in the trees or whatever. In my opinion, the animals were actually pretty well-done and realistic looking - but nobody was ever fooled into thinking that they were live animals. The awkward, mechanical motions they made were the giveaways. Even little kids realized they were fake, but we all played along with it anyway. For me, the fake animals were never the real stars of the show, anyway. The real stars for me were the environments and water features. When we passed some marmots above the next tunnel, peeking up from rocks at the train, the narrator said they "must be a-whistlin' to all you pretty gals." This usually elicited an embarrassed giggle from any young women that happened to be on the train at that time. Next the train meandered over to the Cascade Peak area, which was a beautiful mountain with huge waterfalls flowing down it. It was a very impressive achievement in and of itself. 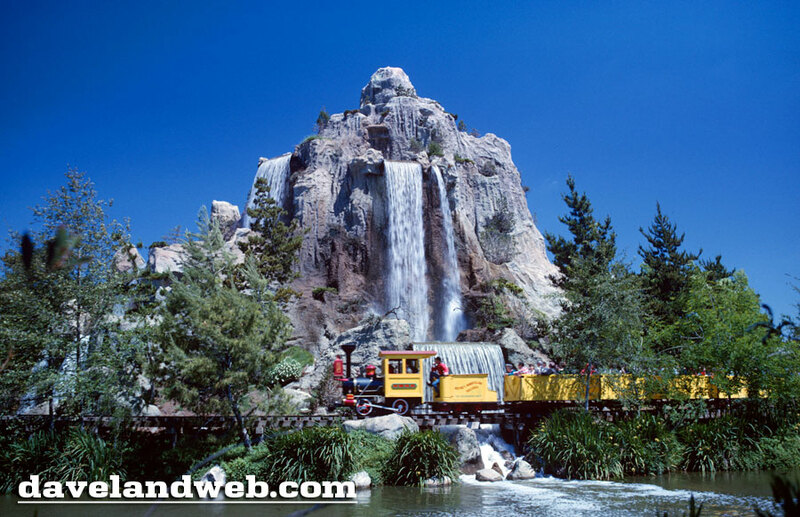 Kind of like the Matterhorn's "little brother" but with more waterfalls. 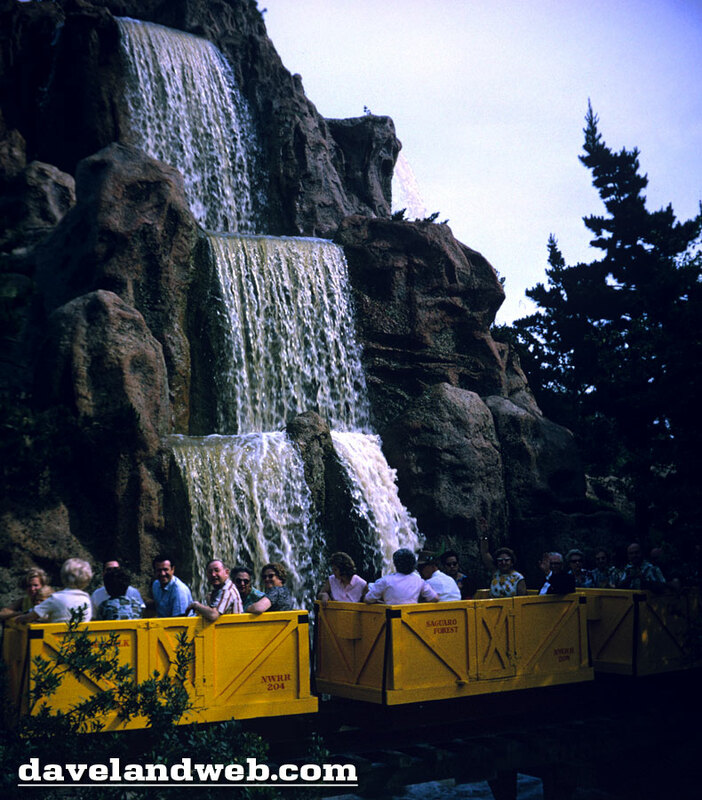 The train went behind one large, wide waterfall and then in front of another waterfall that had multiple drops including the "twin sisters" as the nearest to the train. The walls of water were very close to the train, and sound of the water was thunderous. Massive amounts of water were constantly flowing, all day long. They must have turned it off at night to save on the electricity used by the pumps. Some adults could reach and just barely touch the water if they tried hard, but kids' arms weren't long enough. I guess the reaching for the water wasn't enough of a violation of the "keep your hands and arms inside" rule to make the train come to a stop. The narrator called one of the falls "Twin Sisters, cause they're always babblin." That usually evoked a polite chuckle from the grandparents, while the kids were still mesmerized by the powerful sheets of water seemingly inches away from our reach. 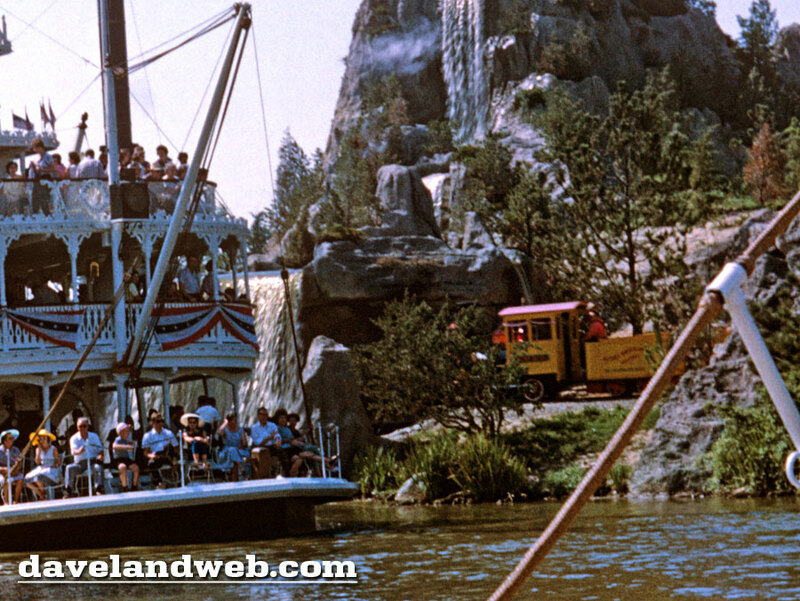 As the train went around Cascade Peak, there was a fine view of one side of Tom Sawyer Island, across the Rivers of America. 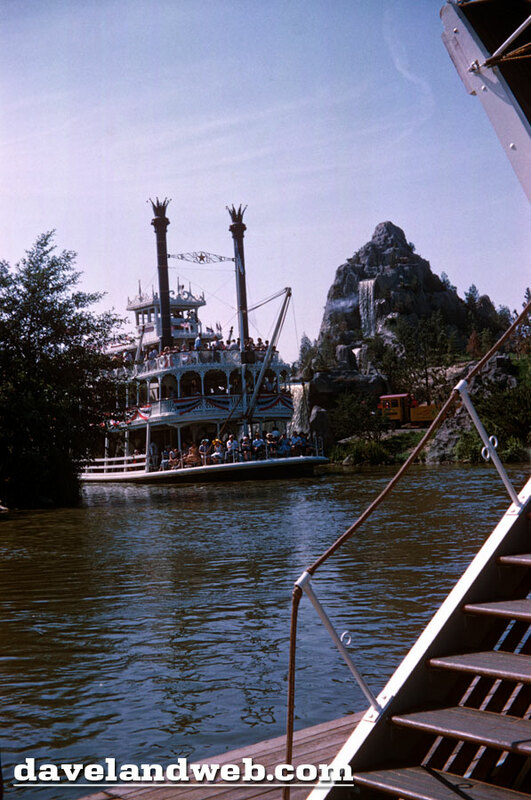 You might also see one of the many watercraft that went around the Rivers, such as the canoes, the keel boats, the Mark Twain or the Columbia; wave to the people on any of these and see if they wave back, or wave to the people on Tom Sawyer Island and see if any wave back. Behold Walt Disney's dream, fully realized, landscaped and populated with guests. 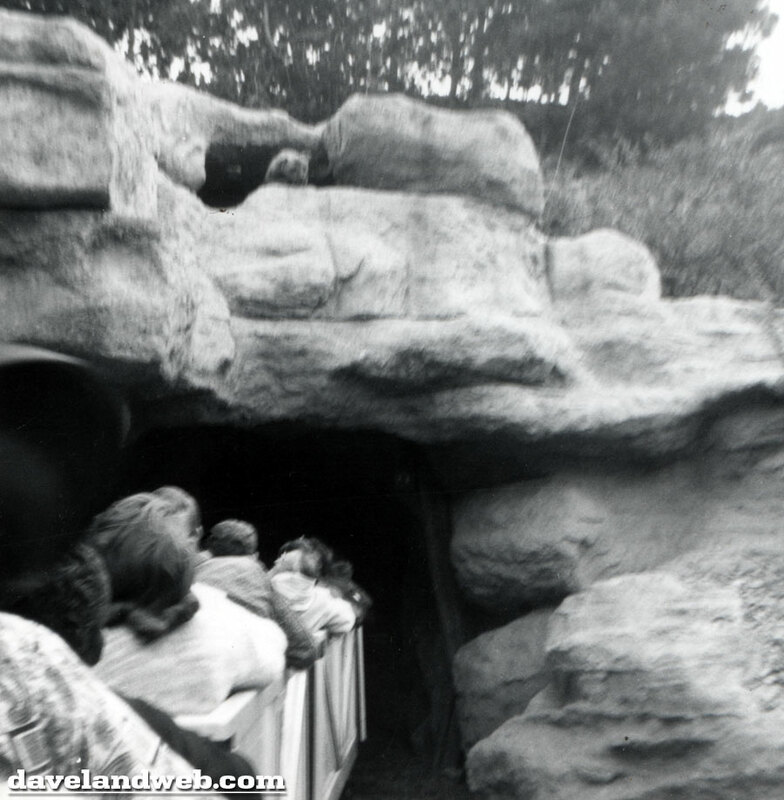 Then the train entered another tunnel and came out into the Bear River part of the attraction (this is sometimes referred to as "Bear Country" in some articles. 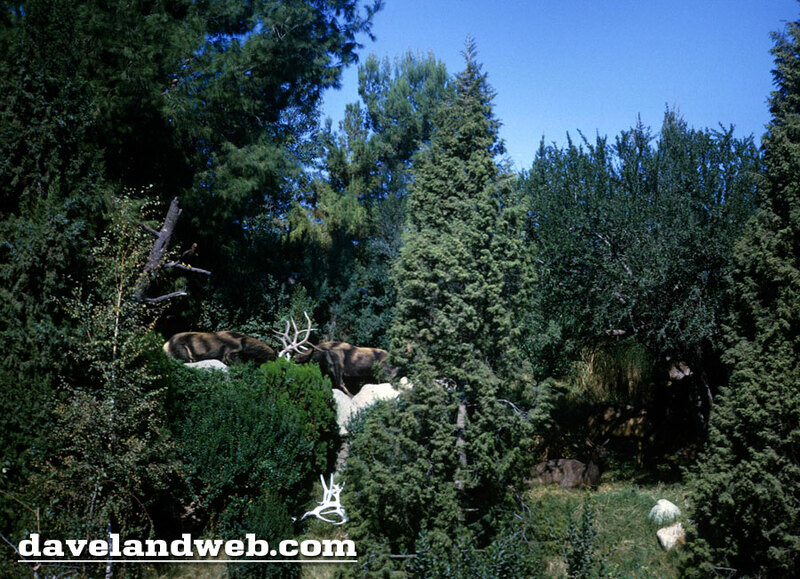 Deepening the confusion, there was also a land in Disneyland called Bear Country, which is now called Critter Country). Immediately after coming out of the tunnel the train crossed a trestle built over a small lake. The trestle was designed to look rickety, with beams at odd angles, and to a kid it seemed really high above the water. It was probably only about 20 feet but it seemed like the water was a long way down. 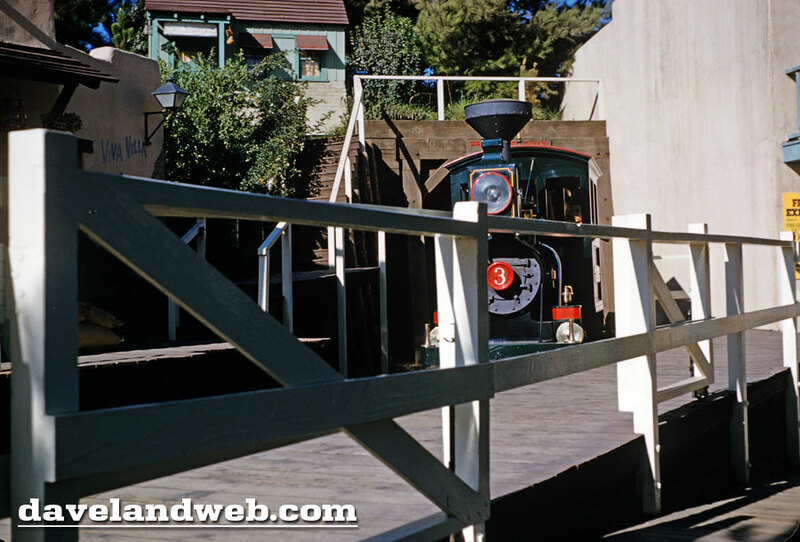 When you were on the trestle, if you were a kid, you couldn't see the track below you, just the green water. If you looked over the edge of the car you could see the track, but it was too scary to look over. In addition there were 2 small platforms on one side of the bridge, with large red barrels marked TNT or something. The narrator didn't mention those, but told us to sit real still, because "No tellin' how long she's gonna last." That was absolutely the last thing I wanted to hear at that moment, and it was always a profound relief when the train left the trestle and went onto solid ground again. In the river below the trestle were 3 sets of bears: one with a fish in its mouth, a group of 3 bears off to the side, and one scratching its back against a tree. There was also another bear over by itself standing up. Sometimes you would see fish jump out of the water (fake fish) but none of those mattered to me. All I wanted was for the train to get off that damned bridge. 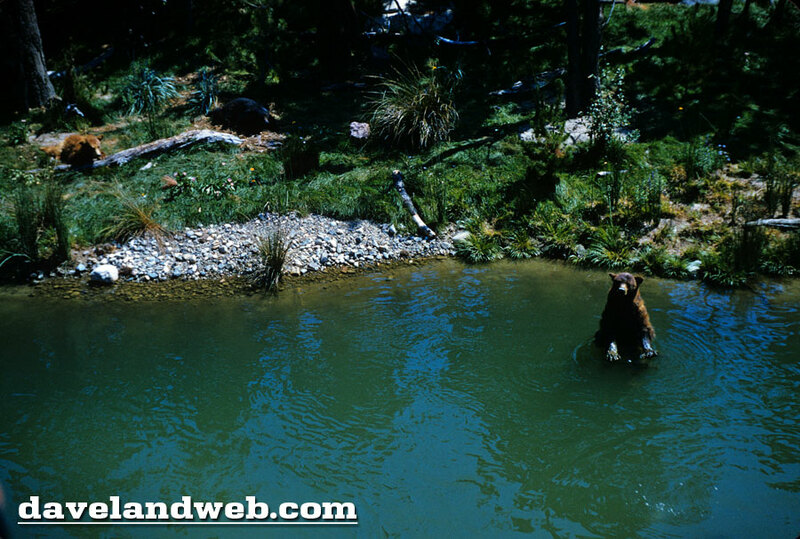 The bear pond was a pretty neat area, though, with the jumping fish and all that. By that point you were deep into the attraction; so deep in fact that you had forgotten all about the long drive to get there, the parking lot, the ticket books, the long walks, the waiting lines... all of that stuff was forgotten and you were totally immersed in the Disneyland experience. 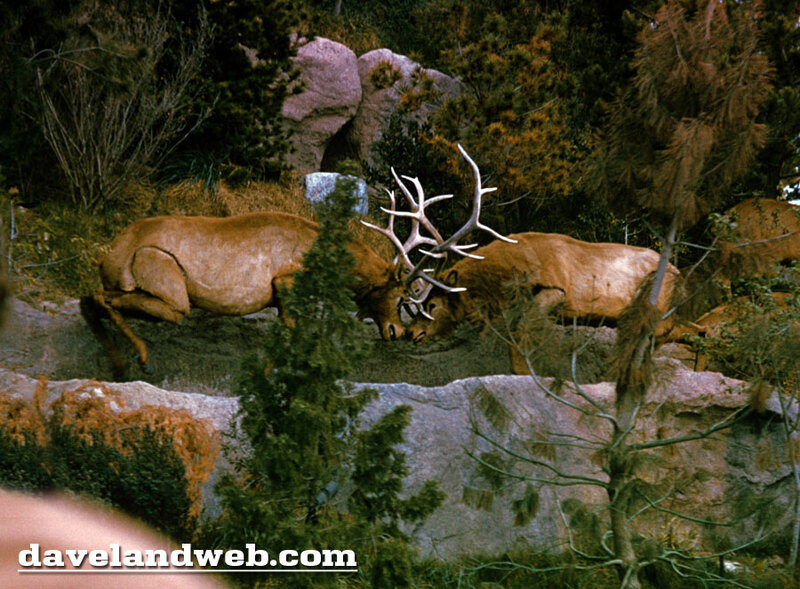 The narrator made a joke about two elk who were in a conflict over a female elk, "Does gittin' two women-folk mean yer the winner or the loser?" to which women on the ride would usually go "Ohhh..." or "Boo!" and at that point it became clear the narrator was quite the misogynist. 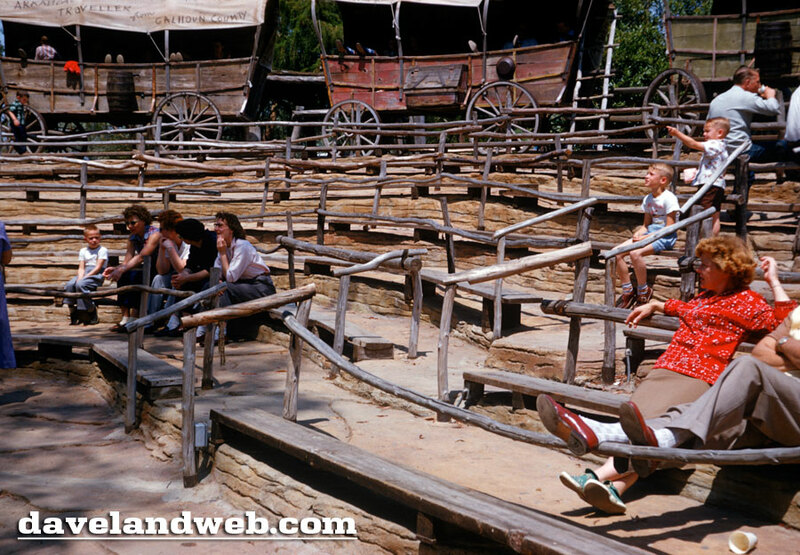 I don't think the script for this ride would be the same if it were being written today. The train then went through Natural Arch Bridge, kind of like something you would see at Canyonlands or Arches National Parks. 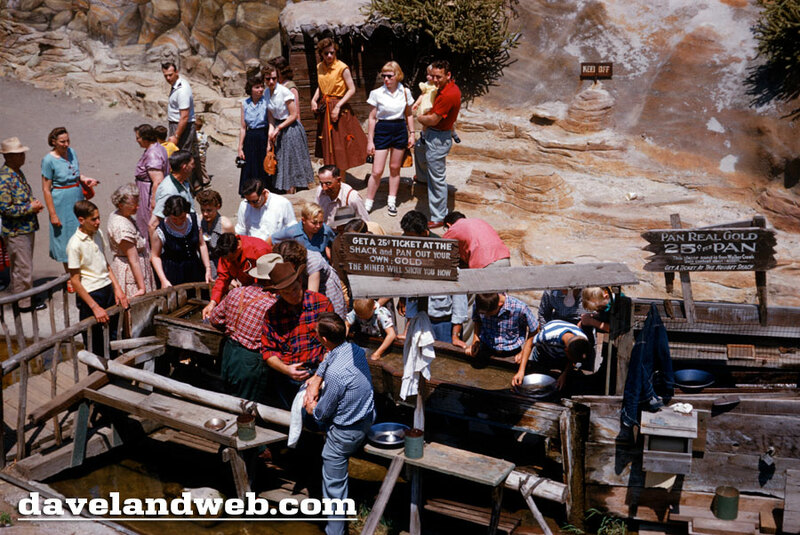 When the Pack Mules attraction was still in operation (1956-1973), you would sometimes see people riding the live mules across the top of the Natural Arch Bridge. Entry through this bridge this signaled a complete change in environment from the lush, leafy, watery world to the barren, dry desert world. 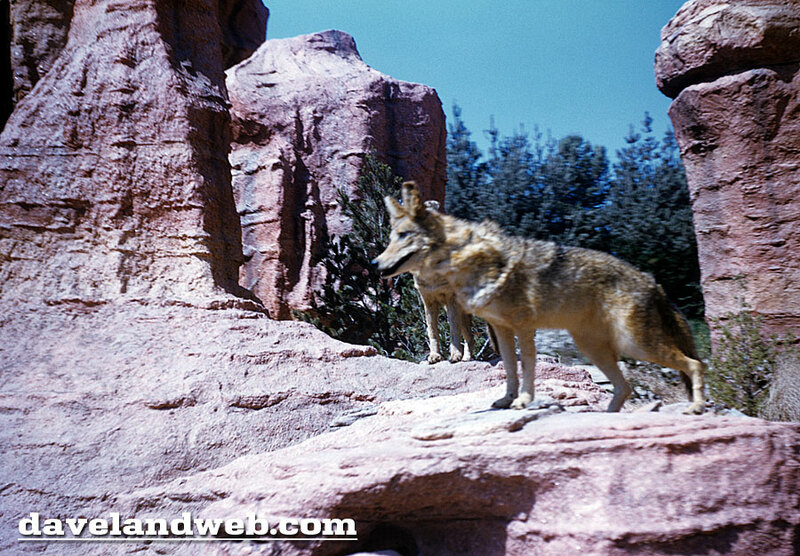 This area was called the Living Desert, named after the 1953 Disney-produced documentary film. This large area had sparse vegetation, but plenty of rock formations, modeled after the red sandstone rock of the American southwest deserts. Some parts of it were reminiscent of Bryce Canyon National Park. The train went through a (fake) saguaro cactus forest, designed to look like Saguaro National Monument (now National Park) near Tucson, Arizona. 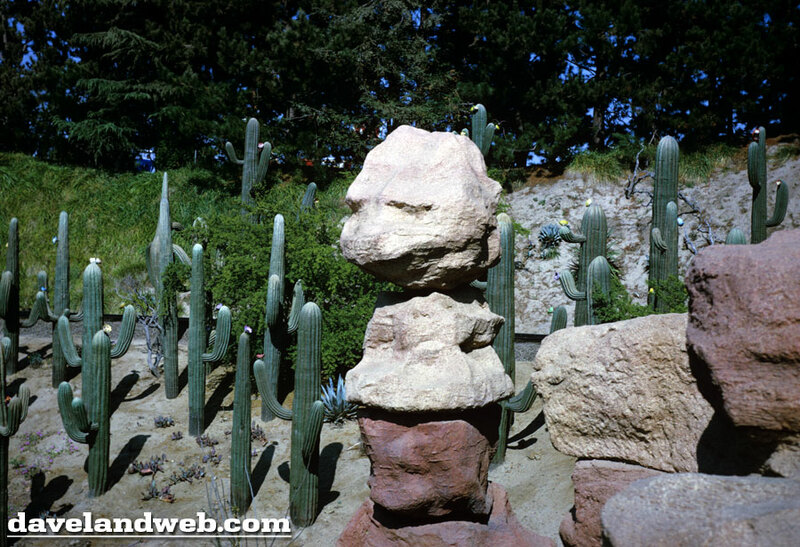 Many of the fake saguaros were deliberately designed to suggest the shapes of people, with arms pointing up or down and facial features consisting of holes in the "cactus" in the right locations. There were shorter ones too, more like barrel cacti, with short "arms" and the same "eyes" punched as holes, and these had white tufts of hair on top. 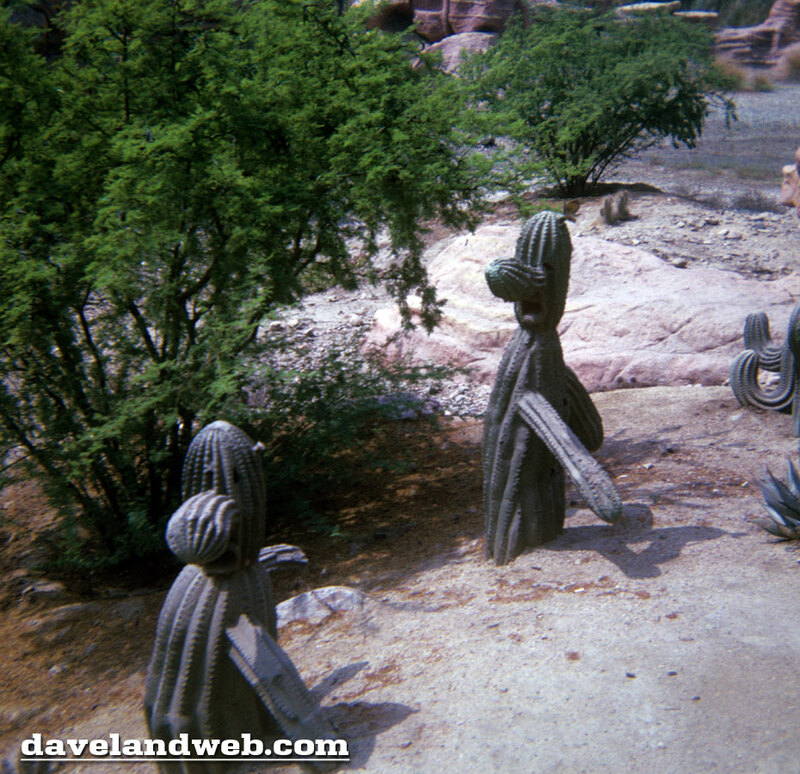 There may well have been some real, live saguaro cacti planted amidst the fake ones, and a few other types of cacti planted just as landscaping, though I'm not really sure. 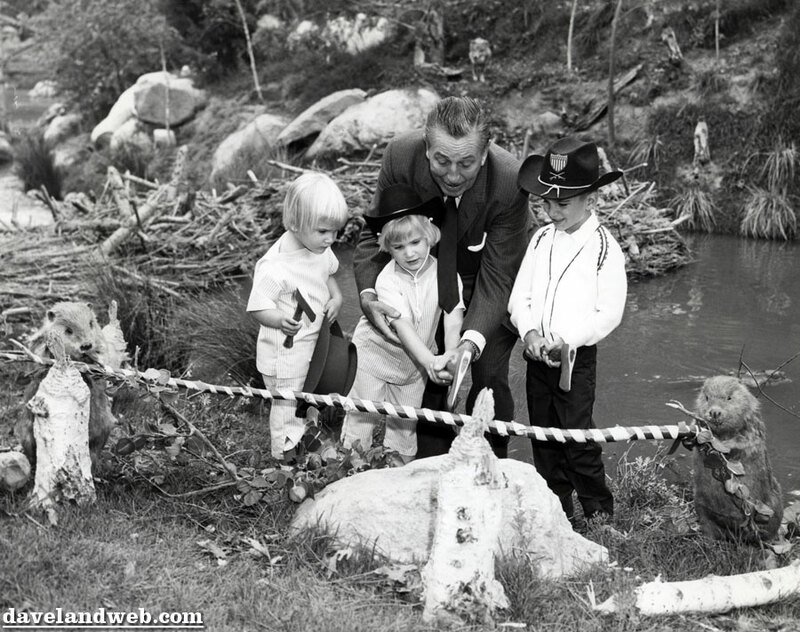 Looking at pictures now I see some Joshua trees and those might have been live. This part of the ride was pretty unconvincing, cartoonish and corny, compared to some of the things that came before and were to come later. An attempt at comedy was made by showing some small wild pigs or warthogs cornering a bobcat which was at the top of one of the saguaro, looking down at them with its head turning slightly. The cat didn't seem to be bothered by the cactus needles which were probably sticking into its paws. There were a couple of large rocks and on top of them, fake rattlesnakes whose heads would bobble back and forth as if they were about to strike. You expected them to suddenly lash out at a passenger any second, but all they did was move their heads back and forth. There was a roadrunner and snake poised facing each other in a kind of standoff. 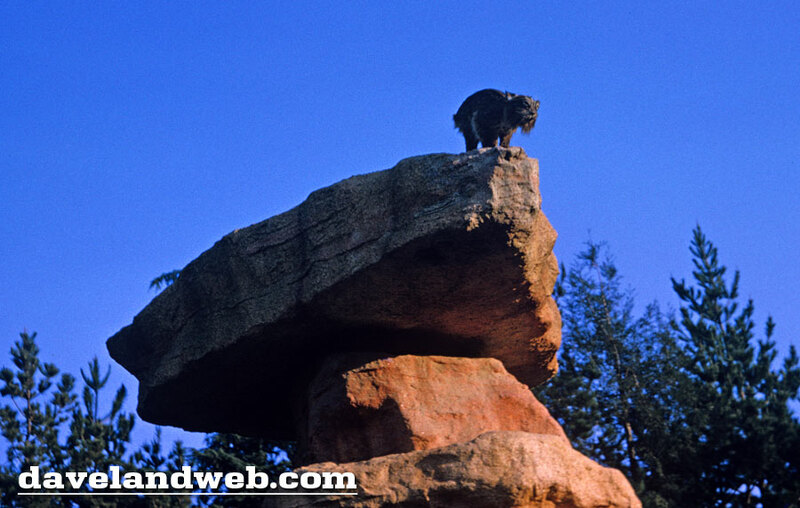 A coyote stood atop another rock and there was a mountain lion crouched and ready to pounce, atop another rock. These were actually fairly well done and realistic looking models, though nobody was genuinely fooled into thinking they were live animals. The fact that they either didn't move or had only awkward mechanical movements was the giveaway. But it could be argued that the area did have some educational value as to what types of wildlife could survive in a desert. The train then moved into a very entertaining and fun area, but one which was also highly fanciful and not really accurate in my opinion. 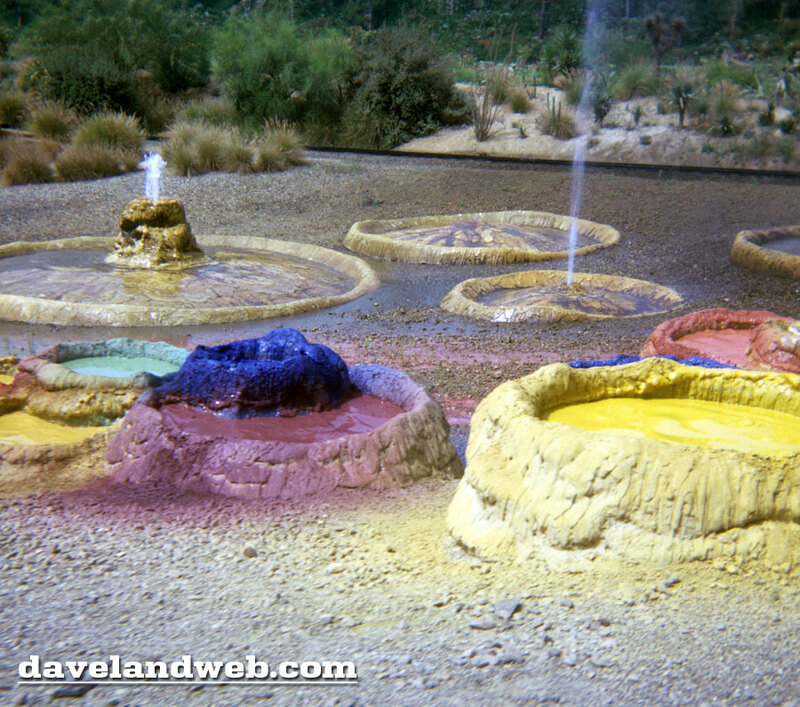 First you saw a group of about 10 bubbling "paint pots" in different colors (blue, red, green, yellow, orange and pink as I recall, but color photos could prove what the actual colors were). Inside each pot it looked like paint that was boiling, and bubbles would emerge and splatter a little, but not so much that it got into an adjacent pot. When a bubble would surface and open you could hear a "plop" sound but it was not that loud. I was fascinated by these and to this day I still wonder how they created the effect in such a way that it could be maintained for years without clogging up or breaking down. Apparently it was inspired by the Fountain Paint Pots and Artist's Paint Pots in Yellowstone National Park, but when I finally made it to Yellowstone years later, I realized the colors of the real ones at Yellowstone were much more subtle than the bright colors of the fake ones at Disneyland. The real Fountain Paint Pots are just gray mud with tints of different colors, although they do have the same action during some months. Oh well, another Disney-borne childhood dream shattered by reality! Right next to the bubbling pots were three geysers, also clearly inspired by Yellowstone. (There was a tiny 4th one too). The biggest one of the 3 large ones was named Old Unfaithful, a direct reference to the famous Old Faithful geyser of Yellowstone. 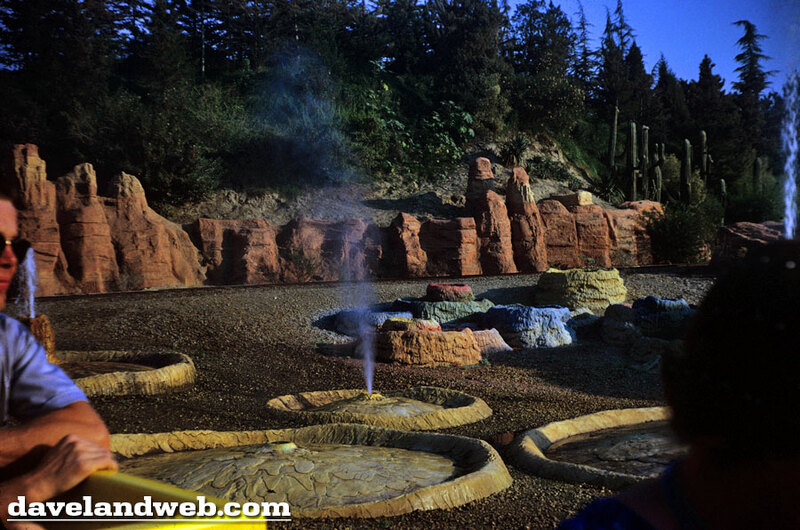 However if they really wanted to pay tribute to Yellowstone, they would have located the geyser in another section of the ride such as Beaver Valley or Bear River, instead of the Living Desert, because Yellowstone is not a desert. 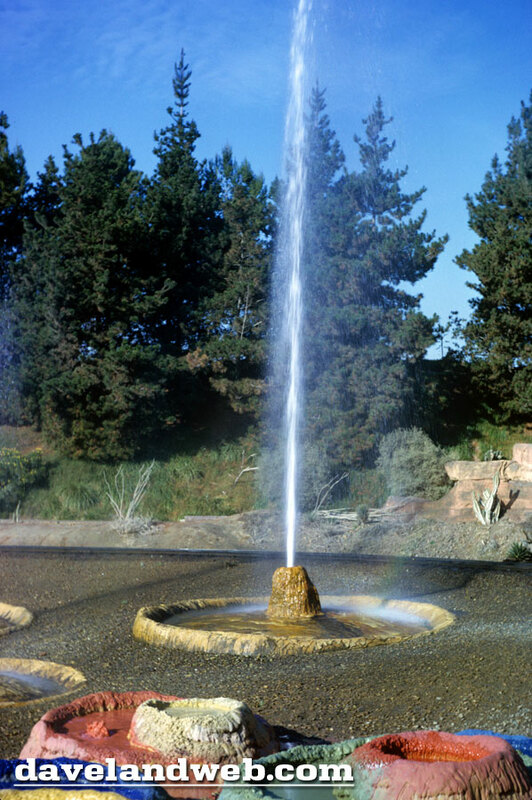 There are a few geysers in deserts but for the most part, geysers are located where rainfall or other sources of water are plentiful. 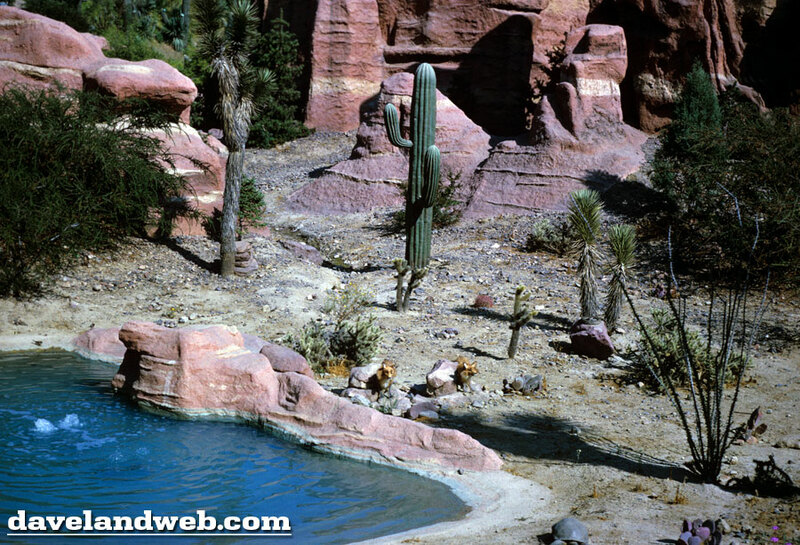 (Same for the paint pots, for that matter - if they were in an actual desert, they would be bone dry and cracked.) 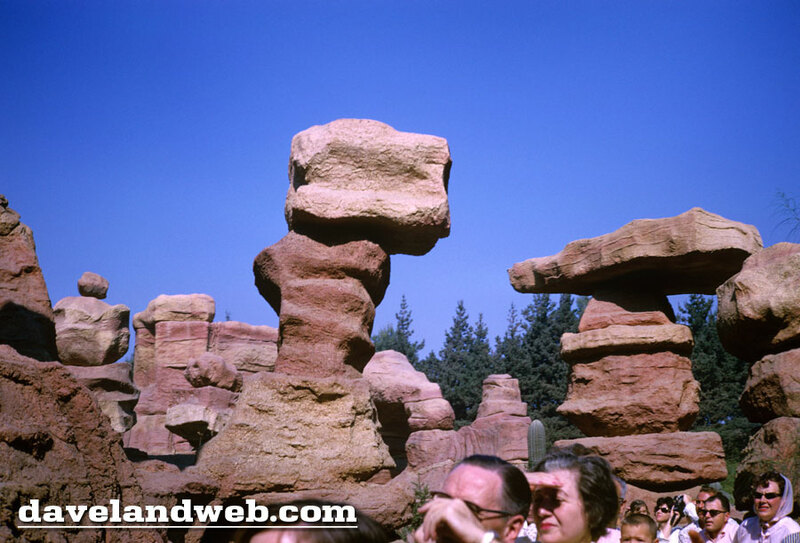 But Disneyland has never been about fact-checking; it has always been about believing, and the geysers were one of the most entertaining points of the ride. When you first saw them, as the train was over by the paint pots, all 3 were going. But by the time the train got to them, they had subsided to the point where they were basically off. The narrator described it as "Old Unfaithful" and remarked that they were likely to blow at any time. "You folks in them last cars be ready... she's a-threatenin' agin!" And sure enough, just as the train was about to leave the geysers behind, the big one did go off suddenly, causing a shriek from the people in the last couple of cars. It didn't actually hit the train with water, but if the wind was blowing the right way, a pretty good dose of spray would blow over and they would definitely get a good misting. On a hot dry summer day that might have been very welcome. Everyone else on the train laughed at the misfortune of the people in the last car. 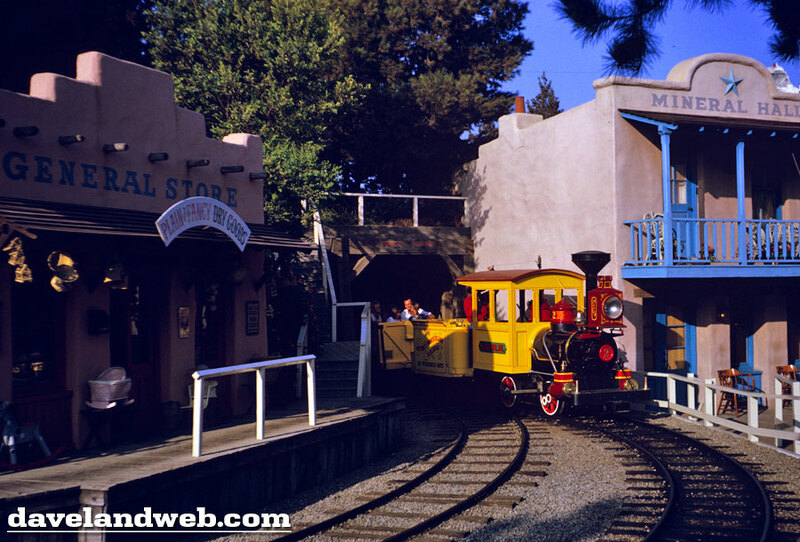 In earlier years, the Disneyland Railroad passed by this area, so there was a chance that if a Mine Train and the Disneyland Railroad were both passing through at the same time, people on the two rides could see each other, and do the waving thing. 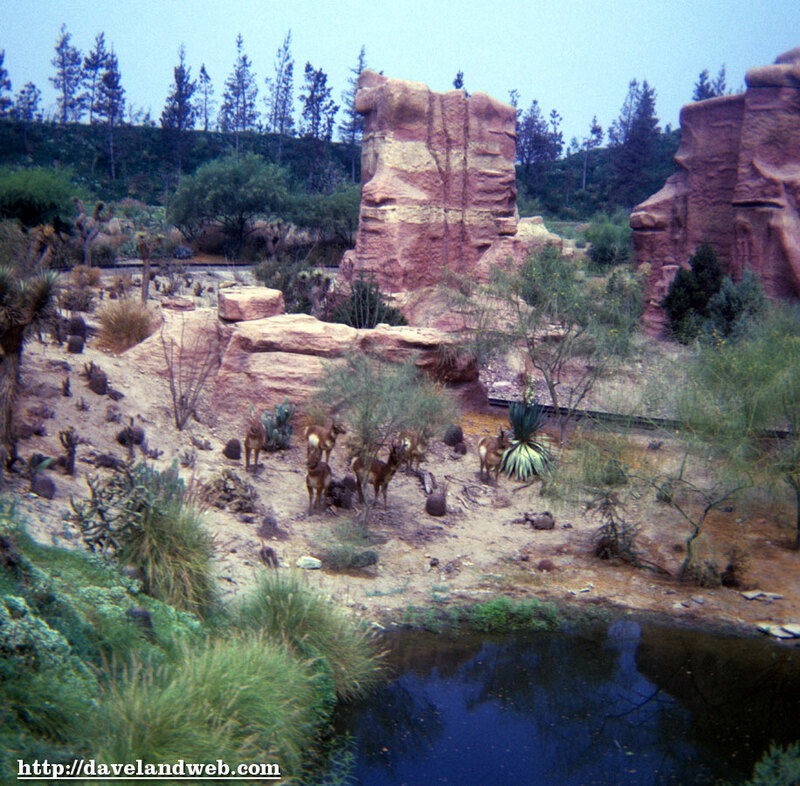 And I think that part of the narration on the Disneyland Railroad did mention the Living Desert in Frontierland, though I'm not sure. 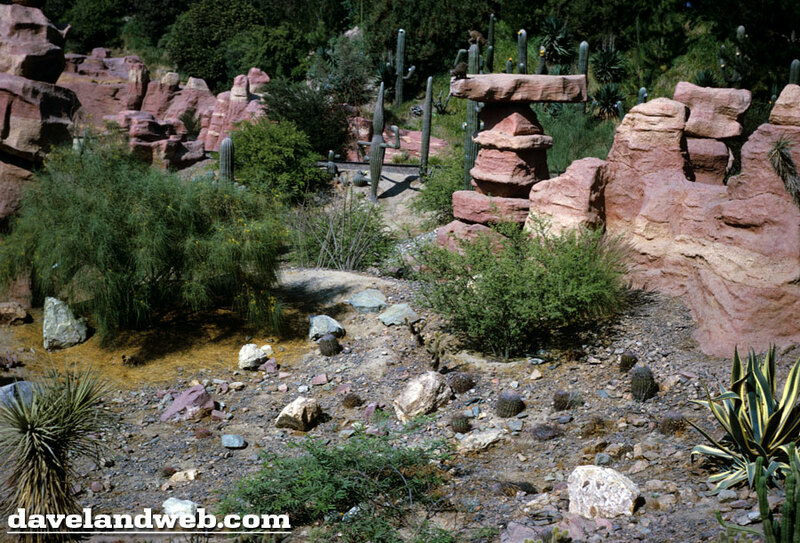 However at some point the track for the Disneyland Railroad was rerouted and the new route did not give a view of the Living Desert. 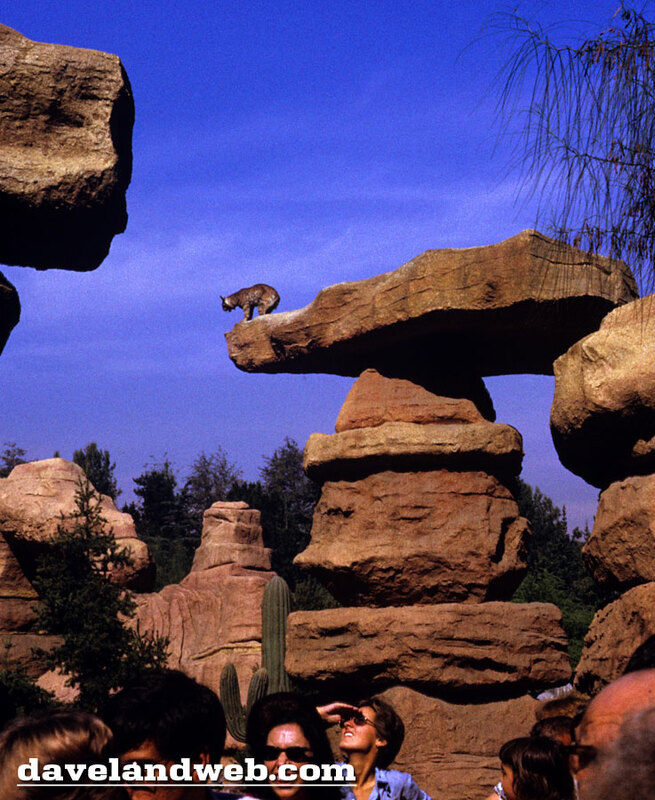 Being on one attraction and seeing guests on a different one at the same time made you realize the genius and beauty of the park's design. The Mine Train ran day and night, but I believe it was a much better show in the daytime. You could see more of it for one thing, and it had a more natural look. At night there were floodlights and spotlights, carefully hidden, but still you realized they were illuminating it. This gave kind of an artificial look to it, in my opinion. Sort of like when you turn the porch light on and catch a glimpse of a raccoon on the lawn. 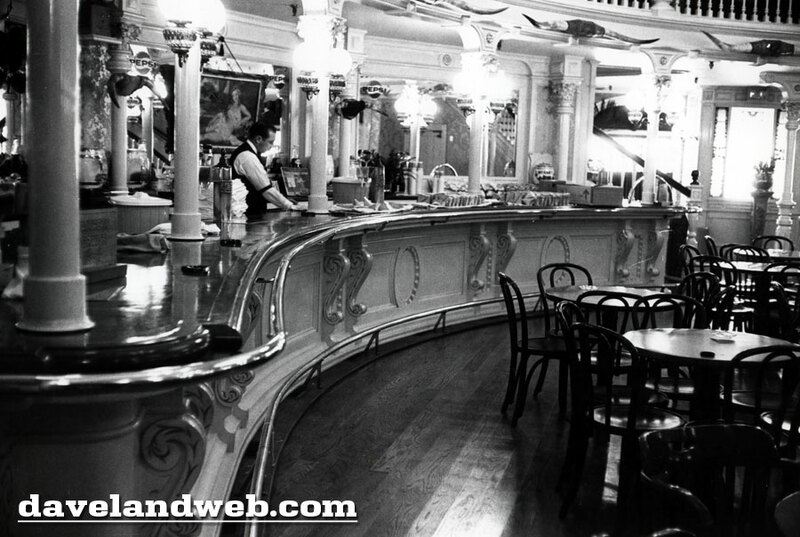 In daylight you saw every detail of the attraction and it was far more impressive and natural-looking. There was only one advantage to riding it at night. Some lucky riders were treated to a view of the nightly fireworks show, and some trains would stop at one point in the Living Desert to let them watch the fireworks. 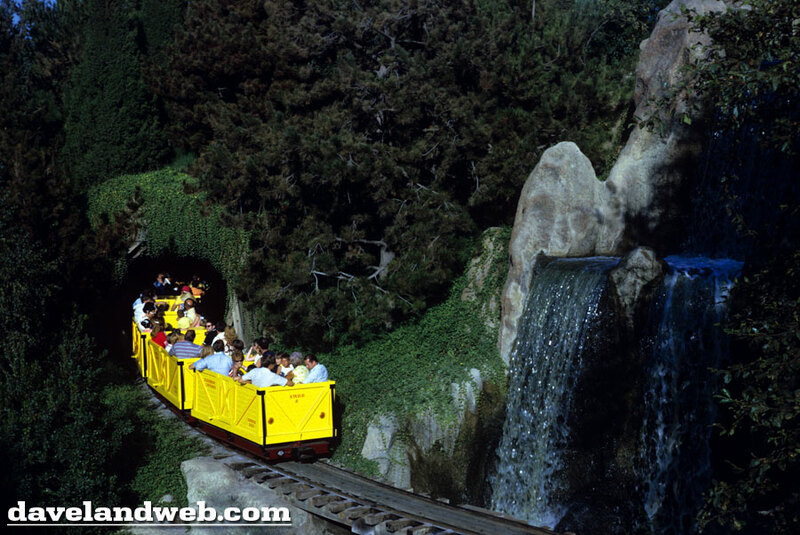 Other than that though, there really was no benefit to riding the Mine Train at night, unless you just wanted to relax and cool off for a while. Probably the best time to ride it was the last hour of daylight, when the setting sun highlighted the waterfalls illuminated the red sandstone rocks and buttes with a rich orange glow, while the sky above deepened to an azure shade and the park's nighttime personality started to awaken. After the geysers, there was a small area of dinosaur bones which was kind of boring. But the next part made up for it. Balancing Rock Canyon was a group of piles of red sandstone "rocks" (which were probably hollow in the middle, but had a pretty convincing appearance of actual rock on the outside). The upper ones were constantly wobbling and I think a couple of the small ones at the tops of the stacks were actually spinning slowly. One of the rocks had another fake bobcat at the top looking down on you as you passed by. The train passed through this area and partially underneath some of the wobbling rocks. It was very scary for a small child, though in later years you realized it was all controlled and none of the rocks would actually fall. 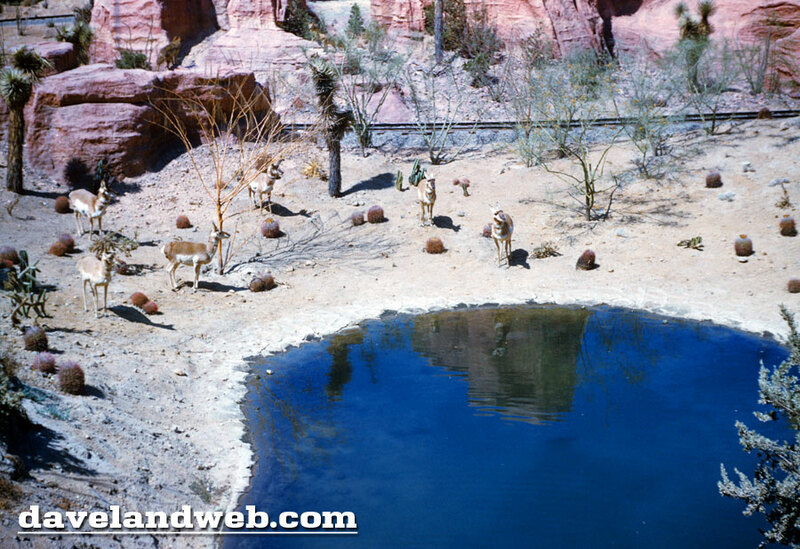 There was a small pond in the desert, apparently a watering hole as there were some kind of gazelle-type animals standing around it. To me the watering hole didn't look right in the desert, it surely would have dried up soon. 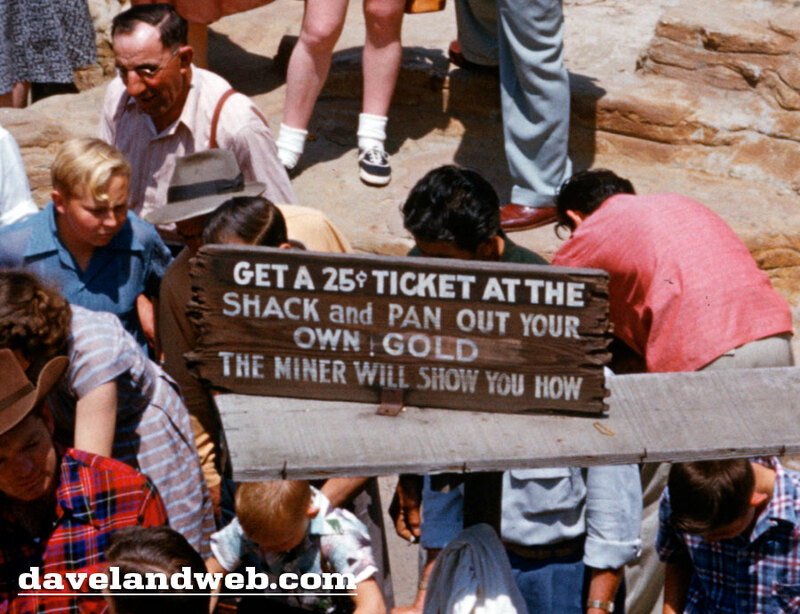 Another peculiarity about the Mine Train was that there was no actual mine evident, or even any miners . It was just a trip through the natural world as Disney saw it. 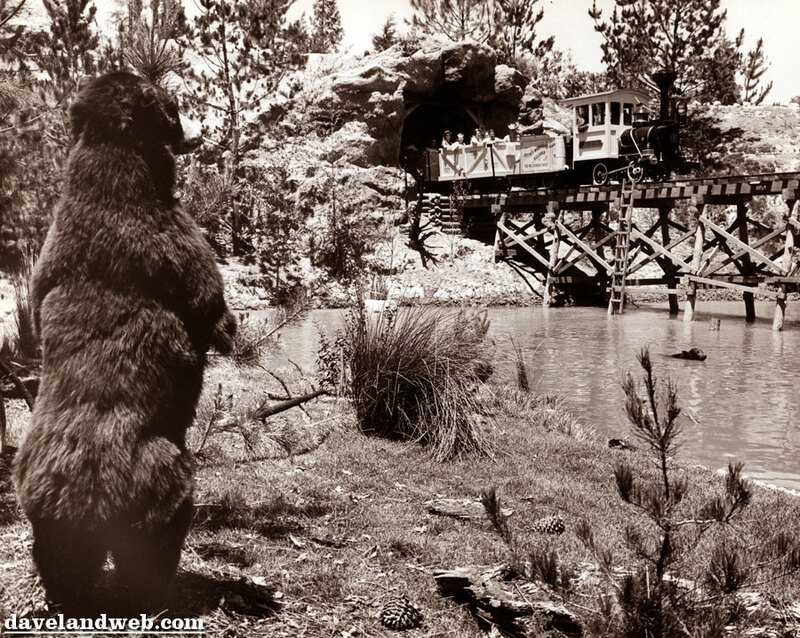 Near the end of the attraction it appeared as if the Mine Train was actually going to enter a mine. The train entered a hole in a hill, and it was pitch black inside. The narrator said, “Now, folks, we're goin' deep into the Earth to view the dazzlin' Rainbow Caverns.” The train didn't actually go downhill, as far as I know the track was level. But the total darkness made it seem like you were going down into a hole. The first part of the caverns was pitch black with nothing to look at. This was to give your eyes a few seconds to adjust to the darkness before you would come upon the display inside. I think it was also to keep stray daylight from ruining the show inside. That was a wise decision, because what was inside was the most beautiful thing that Disneyland has ever had. 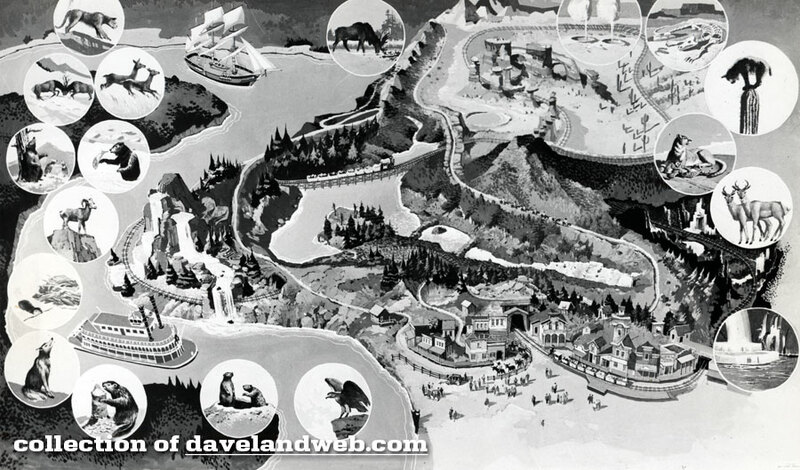 No contest—Rainbow Caverns was the masterpiece of legendary Disney artist and Imagineer Claude Coats (January 17, 1913 - January 9, 1992). 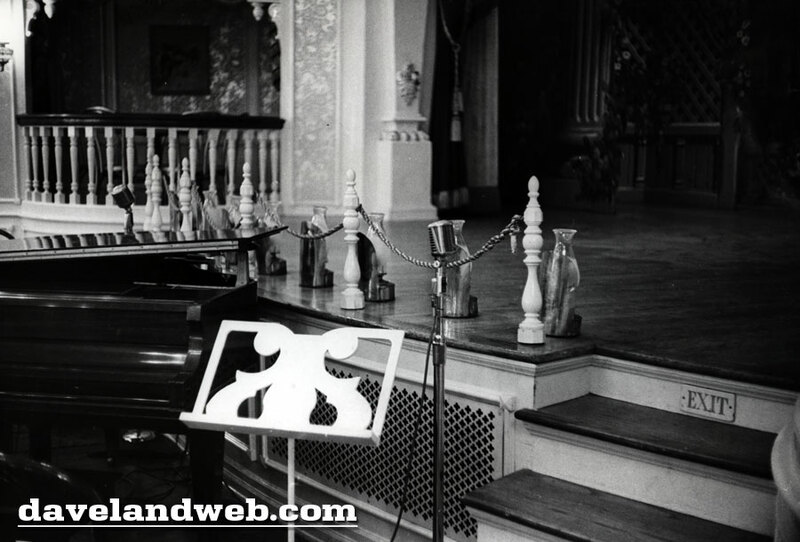 He worked for Disney for 54 years and was involved with the design of many of the best attractions in the park's history, and many of Disney's classic animated films including painting the backgrounds for many of the classic Disney animated films. Without question he is one of the greatest artists and designers in Disney history. 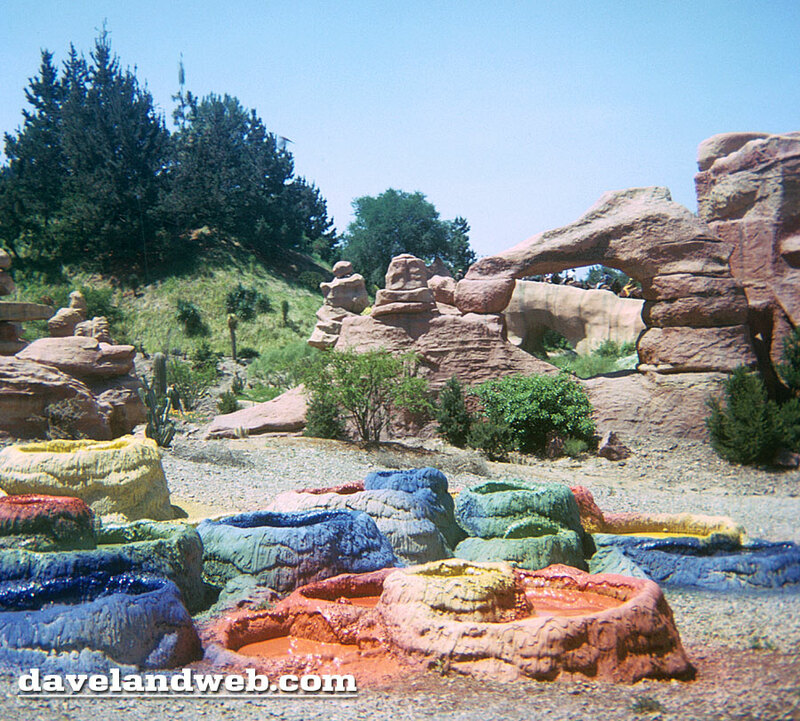 His design and the park's implementation of Rainbow Caverns is what lifts the Mine Train Thru Nature's Wonderland out of the realm of the ordinary and into its truly legendary status. As soon as your eyes started adjusting to the darkness you would start seeing some of the features of Rainbow Caverns. This entire part of the attraction was pitch black and the only illumination came from fluorescent materials which lit up under the many black lights carefully hidden all over the place. I looked around a lot and I only saw blacklights; I never saw any colored lights or spotlights. Claude Coats may have been the world's first "blacklight artist" because he used the various fluorescent pigments in different ways and in different color combinations to create works of art. In Rainbow Caverns most of what you saw was liquid, in the form of fountains, waterfalls and little "rivers" on the floor. These had different colors, created by using large amounts of fluorescent pigments in the water. The plumbing system and maintenance must have been a giant headache because it was very complex, with many water effects each having their own colors. Different waterfalls and "rivers" right next to each other had different colors, and they could not mix with each other. There were small channels of color that even went on the floor underneath the train tracks, and you could peer straight down from the train to see these glowing channels of color liquid right below you. One channel would be green, the next orange, the next blue, the next yellow, and so on. 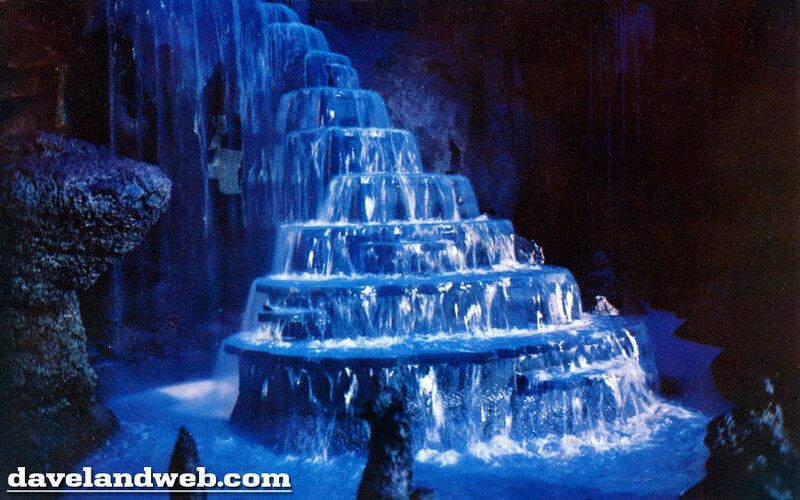 There were some features such as stalactites and stalagmites which were painted in fluorescent colors, but most of what you saw was water in various colors. It was spellbindingly beautiful. Geyser Grotto had small greenish "geyser" type fountains in a greenish pond. Staircase Falls was one feature that was commonly photographed and appears on a famous postcard. However as I recall it was all blue, and though nicely designed and shaped was a little less interesting because it was all one color. There was one waterfall that consisted of six separate falls in six different colors, which really put the "Rainbow" in Rainbow Caverns. Where the colored fountains landed, they continued on the floor in individual channels of each color. The train traveled through the area (which was housed in a building) and it probably spent no more than one minute in the caverns. There were a couple of signs inside the caverns, also painted with flourescent paint and illuminated only by the blacklights. One sign pointed to Witch's Cauldron and that was yet another scare for the kids - although it turned out much to their relief that there was no witch on hand. Another sign on the same pole pointed to Geyser Grotto. There was a third sign but I can't remember what it said. A separate sign in another spot pointed in one direction and the sign said "To Bridal Veil Falls" but I never did figure out which one was Bridal Veil Falls. There are some photographs in existence, and easily found online, that illustrate Rainbow Caverns, but I have yet to see one which really captured it as it looked in person. 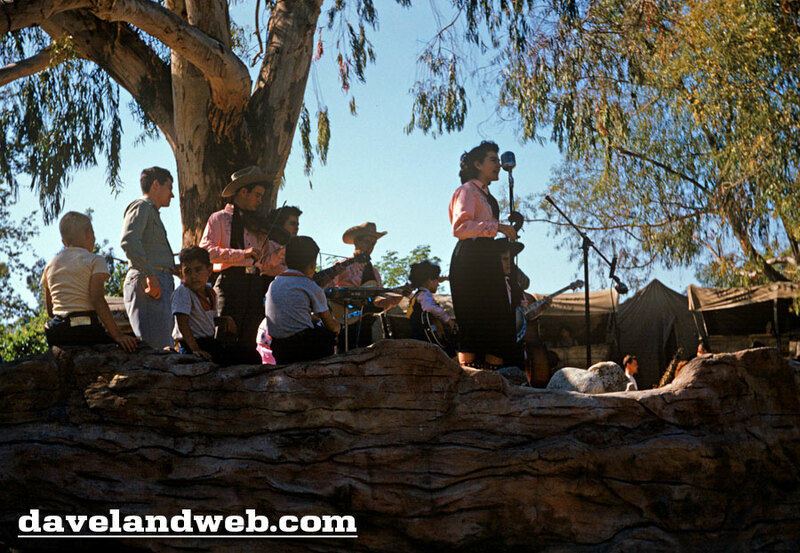 About the best was probably the one taken by National Geographic magazine for their article on Disneyland. 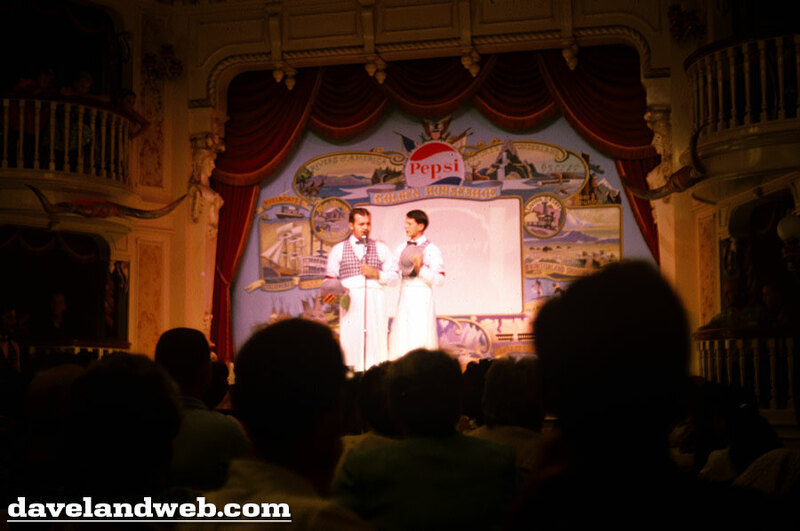 Color films at the time the attraction was in operation were not as sensitive to the relatively feeble light given off by fluorescent materials, and photographers would have to use an ultraviolet filter over the lens to block out the UV from the blacklights. I don't know of any color movies that exist showing Rainbow Caverns though I have seen a couple of black and white video clips, but watching them is akin to looking at one of those videos of an attraction "with the lights on" rather than how it looks in normal operation. The light used with the movie camera washes out any of the fluorescence of the waters. Too bad. The home video cameras of today would easily be able to capture the magnificent colors that were seen. In addition there was a dreamlike music soundtrack playing as you went through Rainbow Caverns, but the sound of rushing water made by the fountains and waterfalls was loud enough to almost drown it out. Too bad because the music was remarkable. 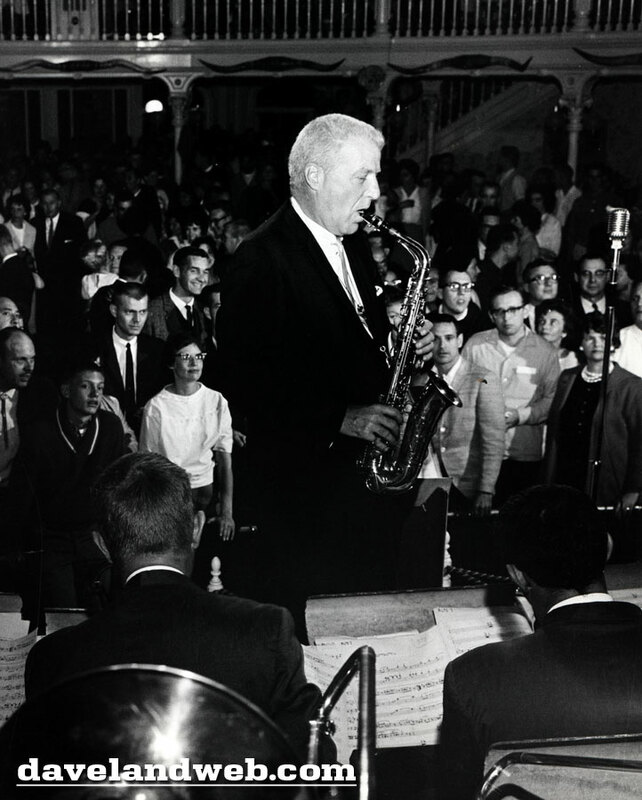 It is also included on "A Musical History of Disneyland" that Disney released in 2005. It's mostly female voices singing a melody with just "ooooo wooooo" as the words, no lyrics. There is a harp and a piano playing in the background, plus another weird instrument that makes a warbling sound (I'm not sure what that instrument is called) altogether it's exotic and dreamy. But as I mentioned, the sounds of the fountains and waterfalls were loud and made even louder to the ears by all of this being indoors. Thus the music did not dominate but could be heard. This was the only section of the Mine Train that had music - the rest of the attraction had the narration and the sounds of nature alone, thankfully. It was cool and refreshing to be in Rainbow Caverns, even for the 45 seconds or whatever it was that the train was actually in it. The Mine Train ride concluded as the train exited that tunnel and arrived at the "town" of Rainbow Ridge, and stopped at the same location it was at when you got on the train. The recorded narration encouraged you to lift the jump seat of the car yourself, and the door would automatically open. Of course most kids wanted to be the one that lifted it. And magically the door did open. After a final "So long!" from Dallas McKennon, you got off the train. Then the next set of guests boarded the same train. 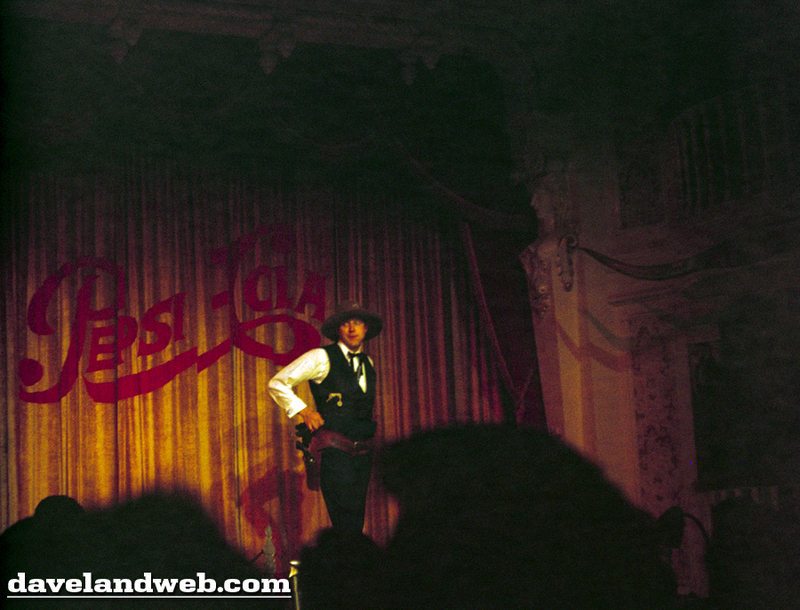 You walked on the platform to the right to get to the exit, and then you were back in Frontierland again, for your next adventure. 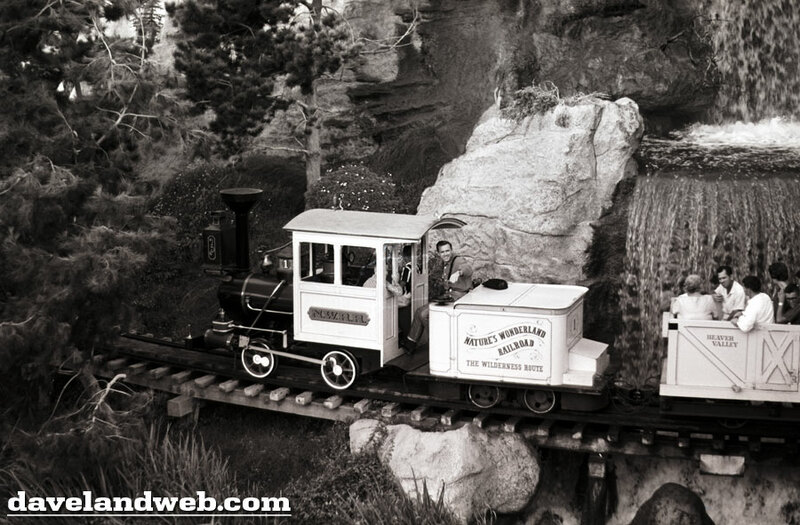 For a few years (July 1956 to December 1962) there was a small attraction next to the Mine Train, to the right of the main buildings of Rainbow Ridge, with the same type of old-west style building, and this was called Mineral Hall. There was a free exhibit where you could view fluorescent minerals and even ordinary household items under blacklight, and some exhibits on the use of black light in practical applications such as criminology, etc. There was a gift shop where you could buy blacklights and fluorescent materials such as paints and chalk. Unfortunately Mineral Hall closed before the first time I went to Disneyland. Thanks a million, Bob - I couldn't have said it better myself! 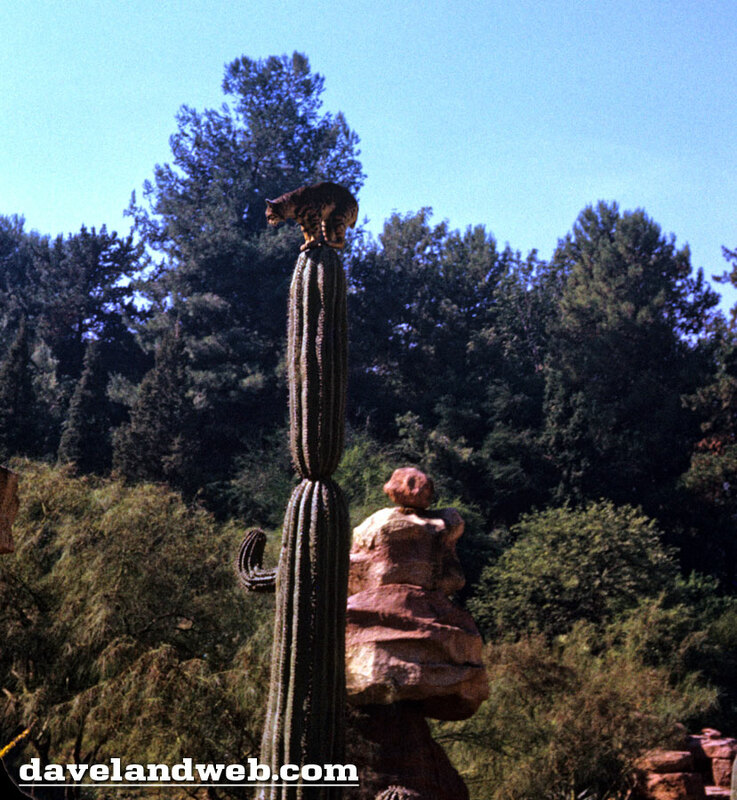 See more vintage Disneyland Nature's Wonderland attraction photos on my Nature's Wonderland web page.